Методическая разработка урока по страноведению. Тема "Wales. Scotland. 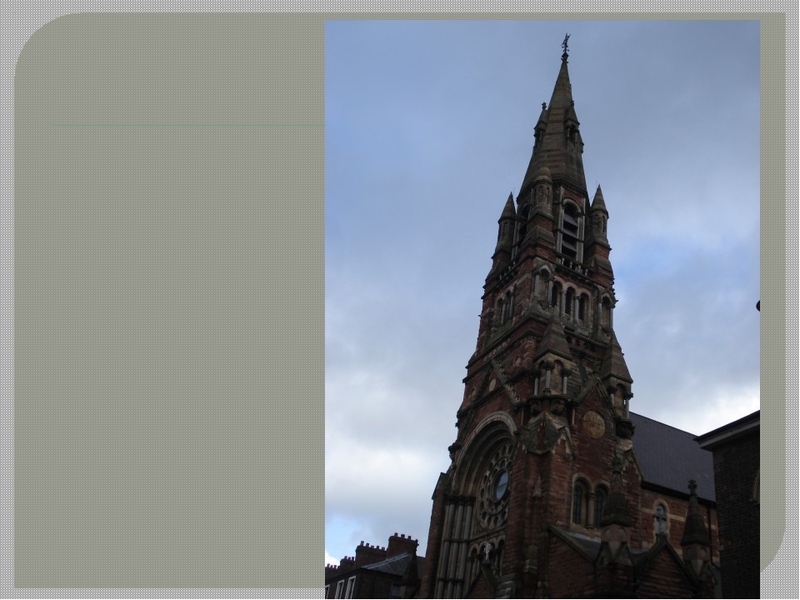 Northern Ireland"
Главная / Иностранные языки / Методическая разработка урока по страноведению. Тема "Wales. Scotland. 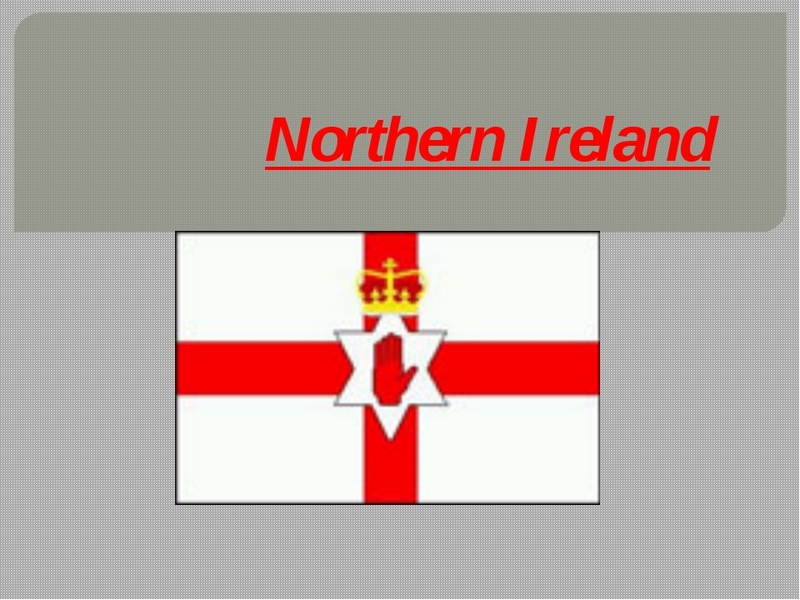 Northern Ireland"
Northern Ireland, integral part of the United Kingdom of Great Britain and Northern Ireland, situated in the northeastern portion of the island of Ireland. 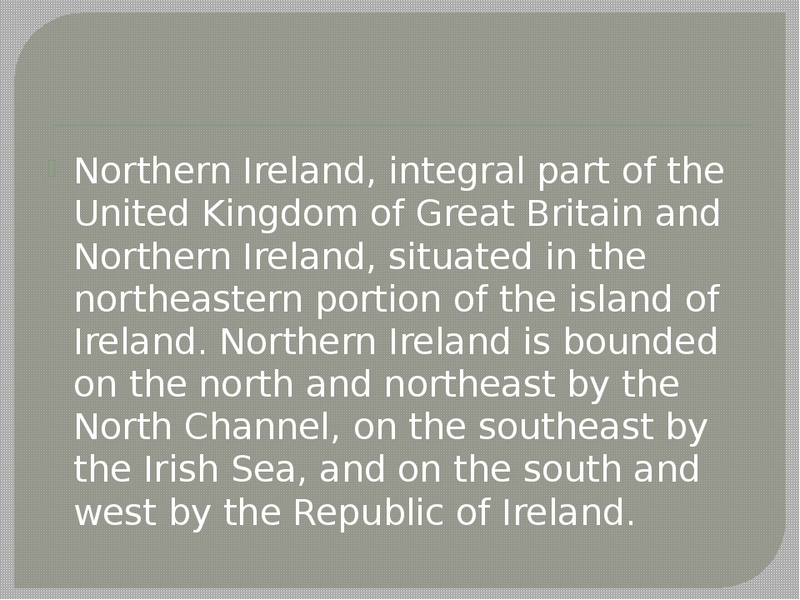 Northern Ireland is bounded on the north and northeast by the North Channel, on the southeast by the Irish Sea, and on the south and west by the Republic of Ireland. 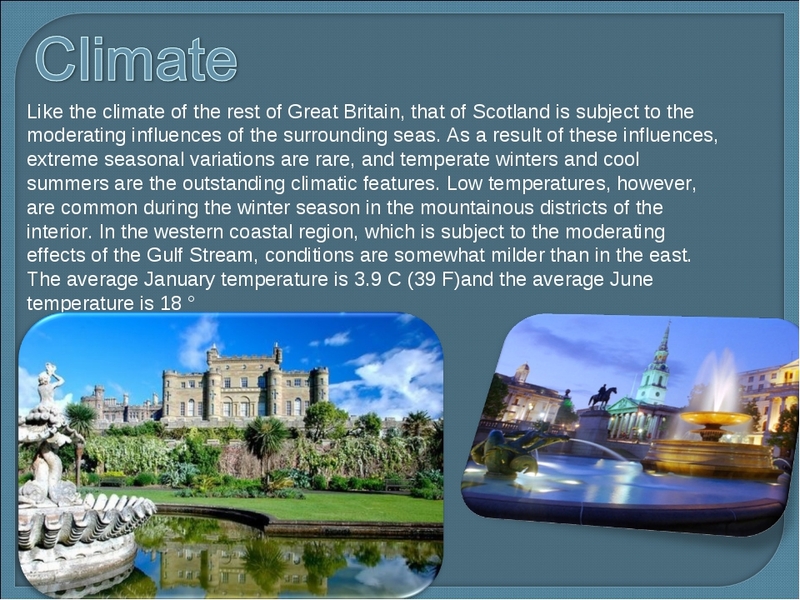 Climate The climate of Northern Ireland is mild and damp throughout the year. The level of humidity is high. 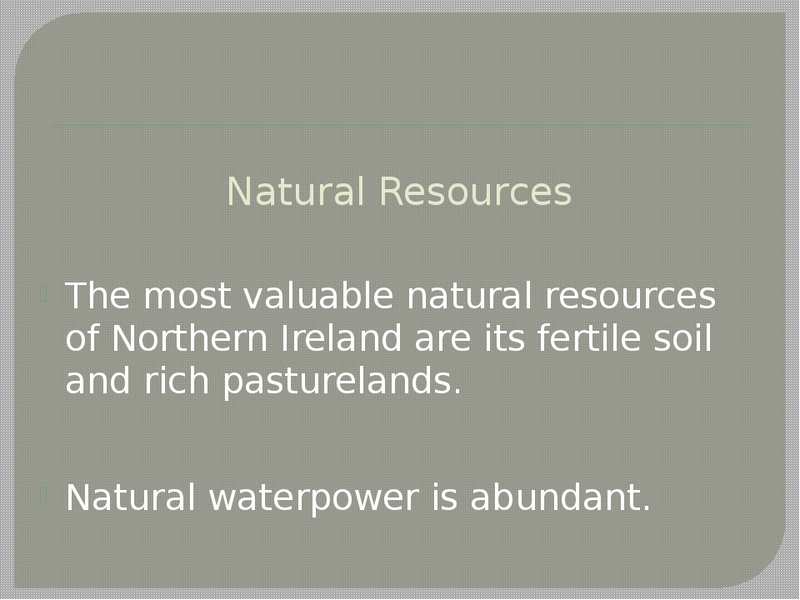 Natural Resources The most valuable natural resources of Northern Ireland are its fertile soil and rich pasturelands. Natural waterpower is abundant. 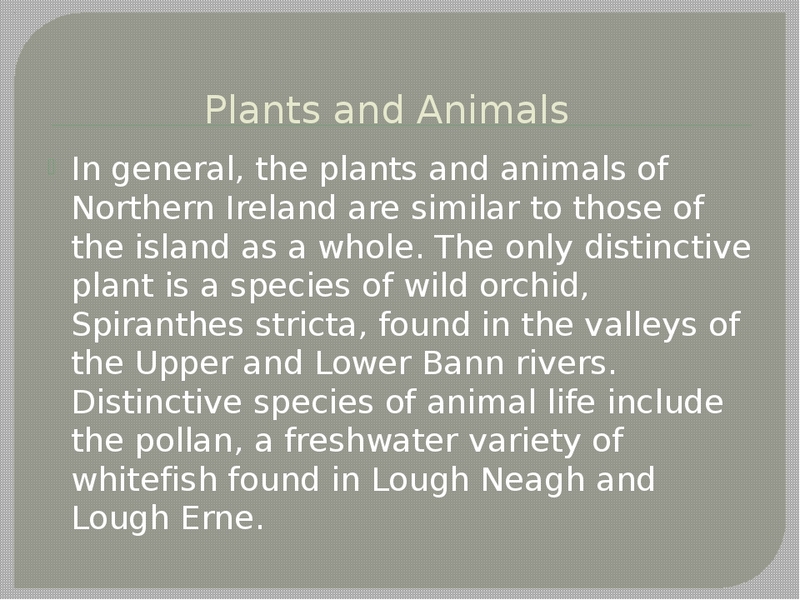 Plants and Animals In general, the plants and animals of Northern Ireland are similar to those of the island as a whole. The only distinctive plant is a species of wild orchid, Spiranthes stricta, found in the valleys of the Upper and Lower Bann rivers. Distinctive species of animal life include the pollan, a freshwater variety of whitefish found in Lough Neagh and Lough Erne. 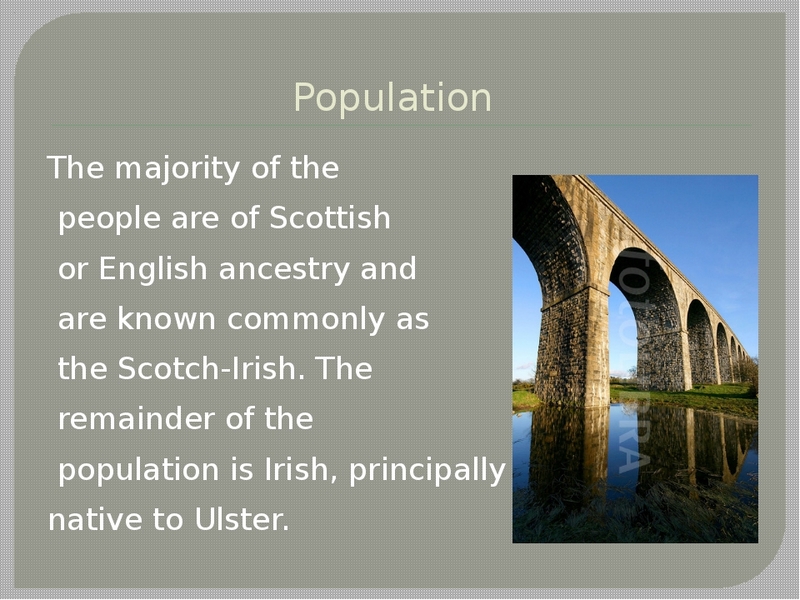 Population The majority of the people are of Scottish or English ancestry and are known commonly as the Scotch-Irish. 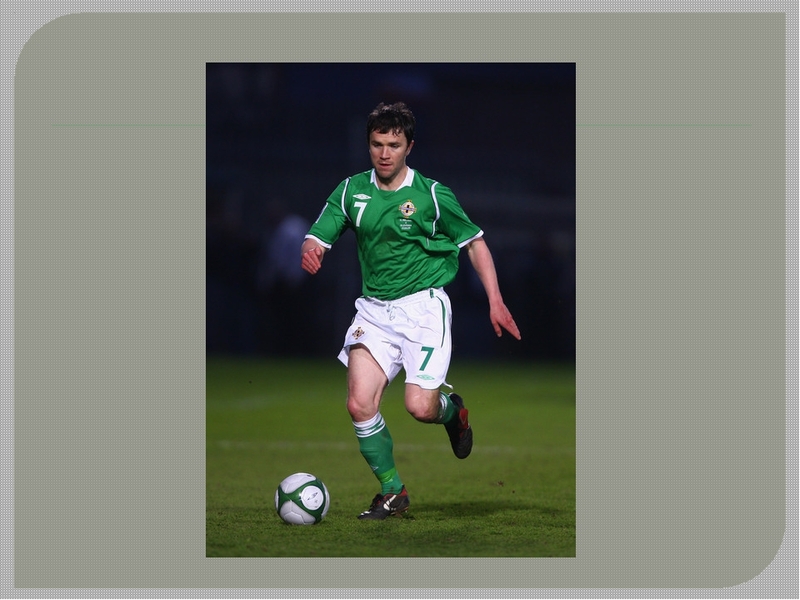 The remainder of the population is Irish, principally native to Ulster. English is the sole official language. 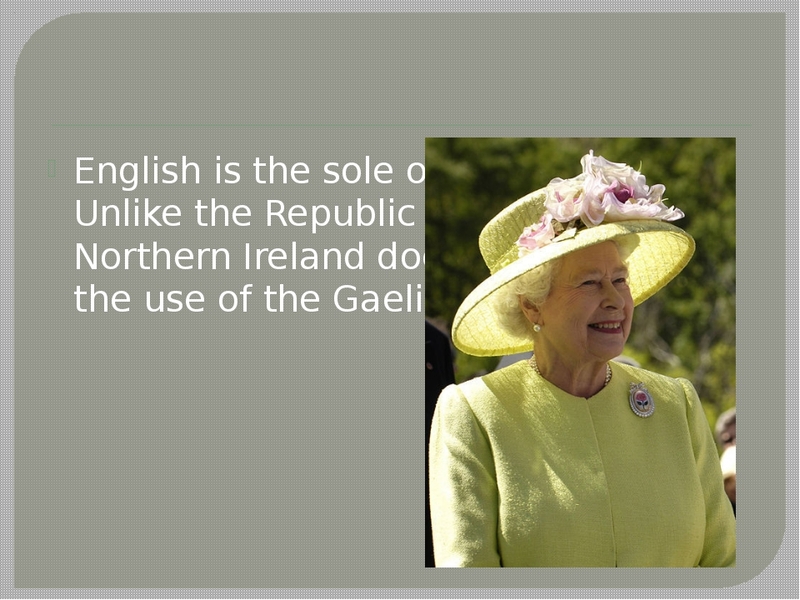 Unlike the Republic of Ireland, Northern Ireland does not encourage the use of the Gaelic language. 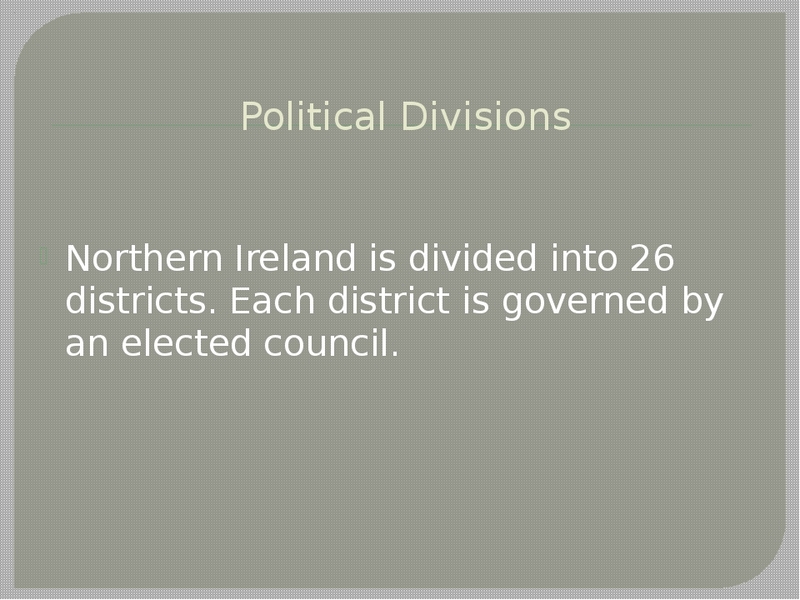 Political Divisions Northern Ireland is divided into 26 districts. Each district is governed by an elected council. 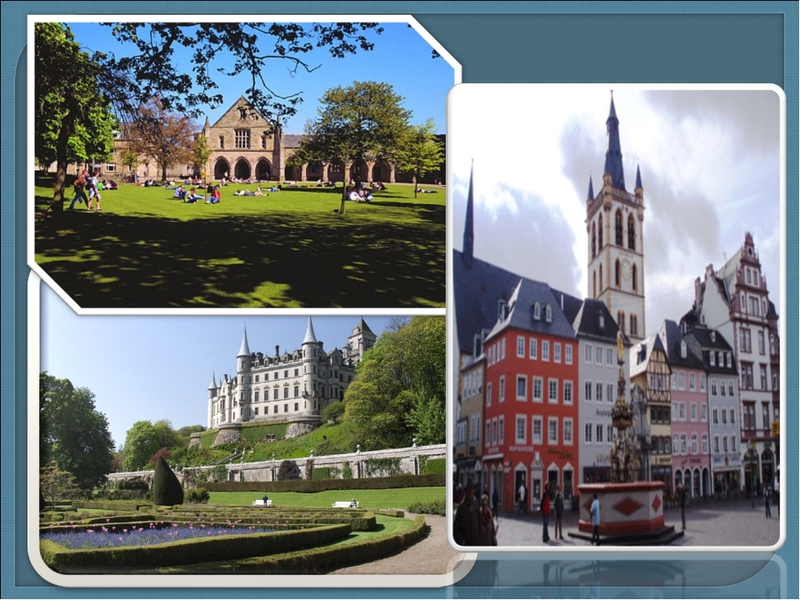 In the early 1990s, almost 51 percent of the population regarded themselves as Protestant, and almost 39 percent as Roman Catholic. 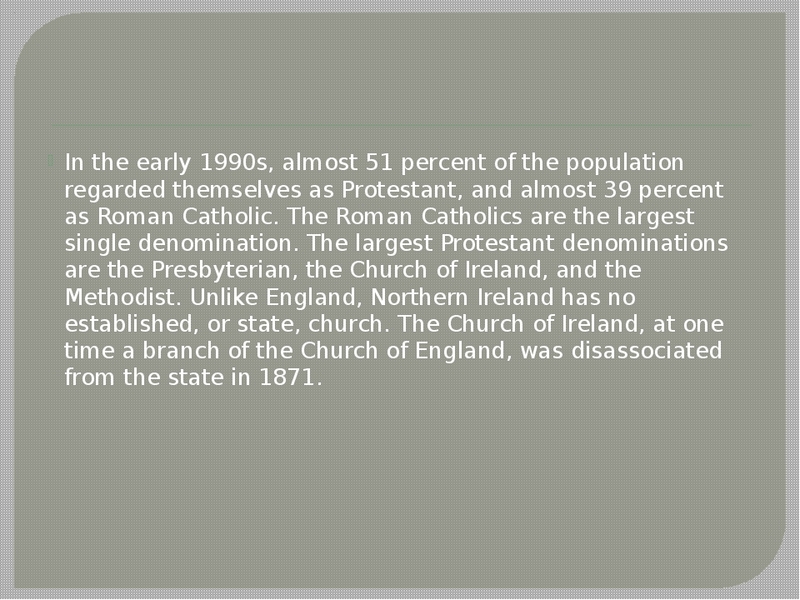 The Roman Catholics are the largest single denomination. 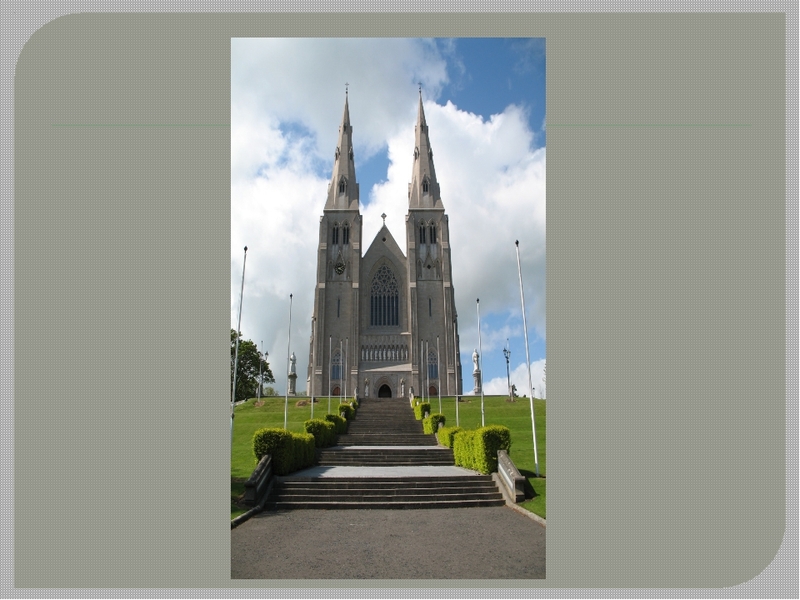 The largest Protestant denominations are the Presbyterian, the Church of Ireland, and the Methodist. 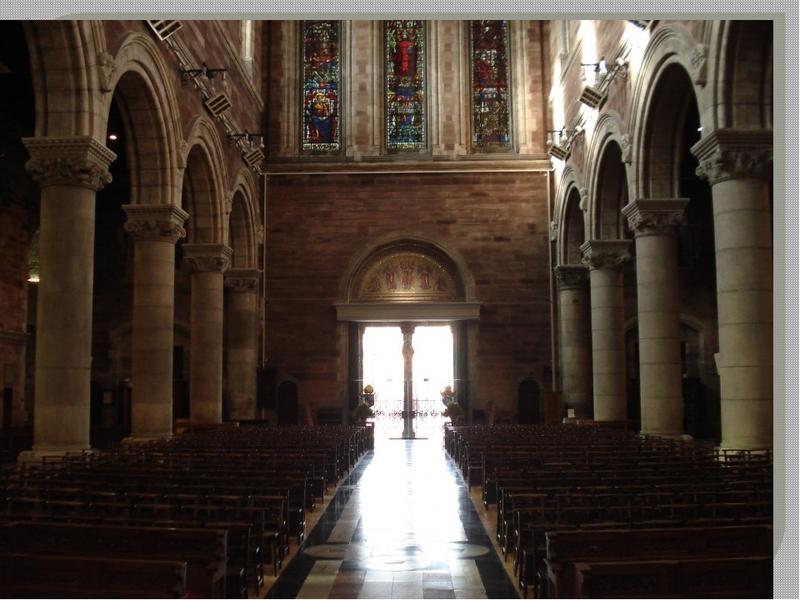 Unlike England, Northern Ireland has no established, or state, church. 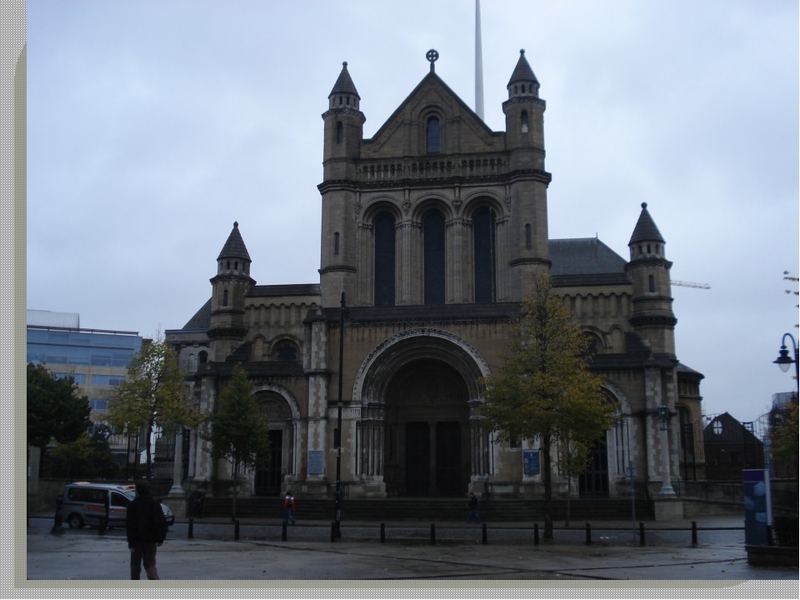 The Church of Ireland, at one time a branch of the Church of England, was disassociated from the state in 1871. 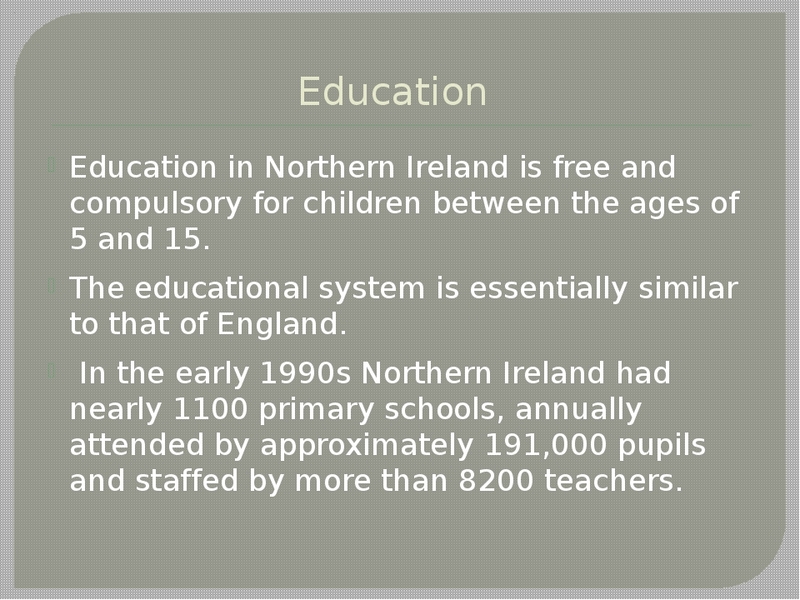 Education Education in Northern Ireland is free and compulsory for children between the ages of 5 and 15. The educational system is essentially similar to that of England. 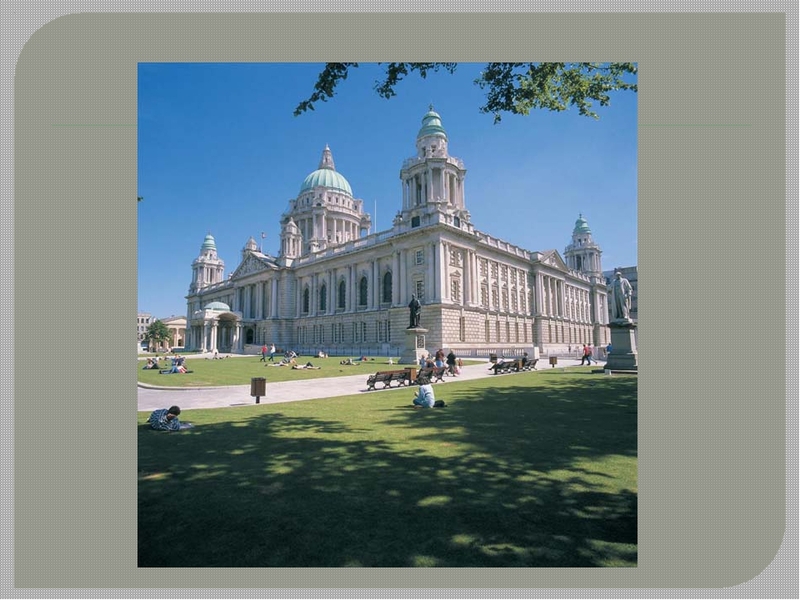 In the early 1990s Northern Ireland had nearly 1100 primary schools, annually attended by approximately 191,000 pupils and staffed by more than 8200 teachers. 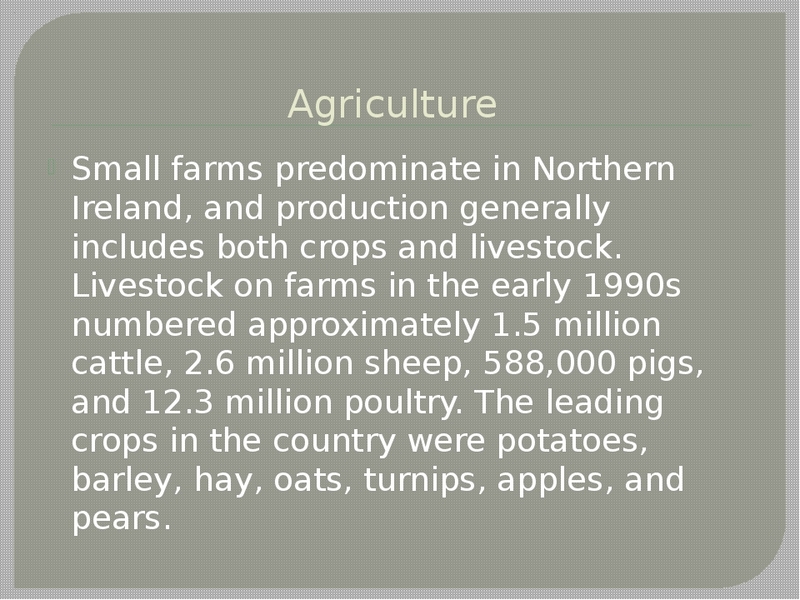 Agriculture Small farms predominate in Northern Ireland, and production generally includes both crops and livestock. Livestock on farms in the early 1990s numbered approximately 1.5 million cattle, 2.6 million sheep, 588,000 pigs, and 12.3 million poultry. The leading crops in the country were potatoes, barley, hay, oats, turnips, apples, and pears. 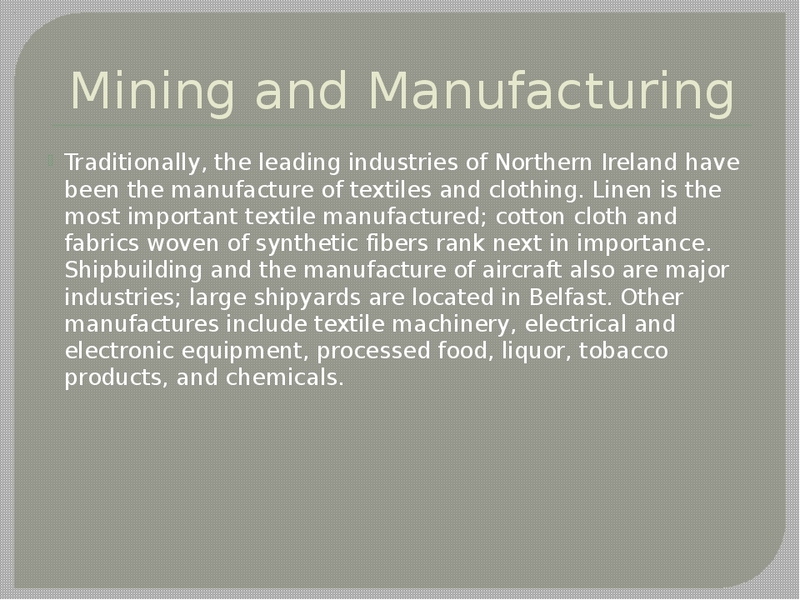 Mining and Manufacturing Traditionally, the leading industries of Northern Ireland have been the manufacture of textiles and clothing. Linen is the most important textile manufactured; cotton cloth and fabrics woven of synthetic fibers rank next in importance. 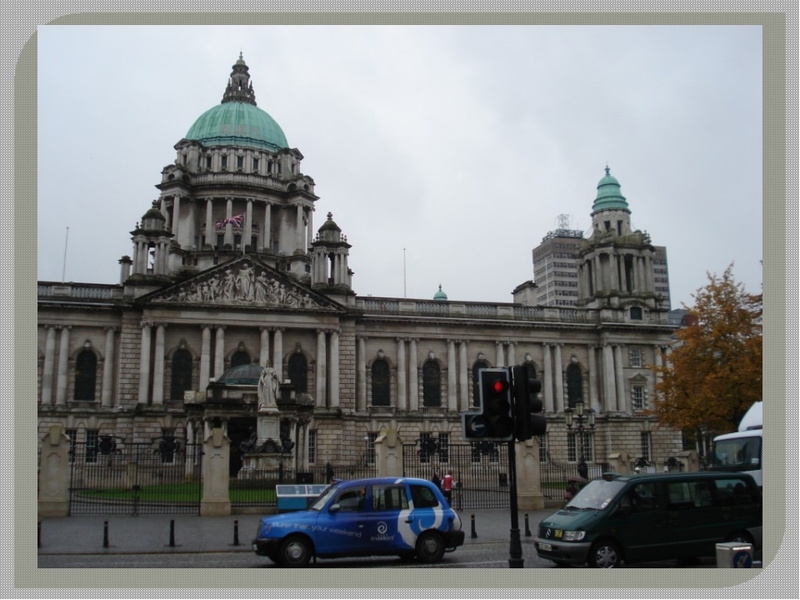 Shipbuilding and the manufacture of aircraft also are major industries; large shipyards are located in Belfast. Other manufactures include textile machinery, electrical and electronic equipment, processed food, liquor, tobacco products, and chemicals. 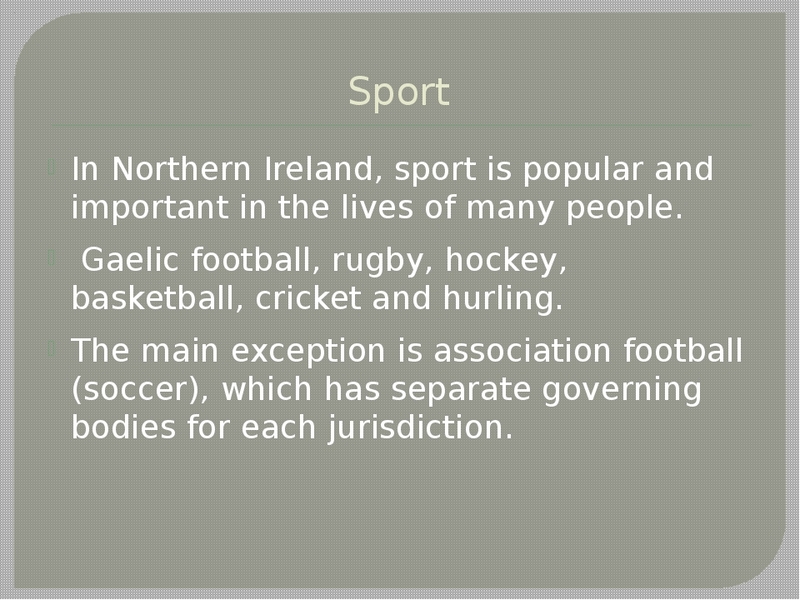 Sport In Northern Ireland, sport is popular and important in the lives of many people. 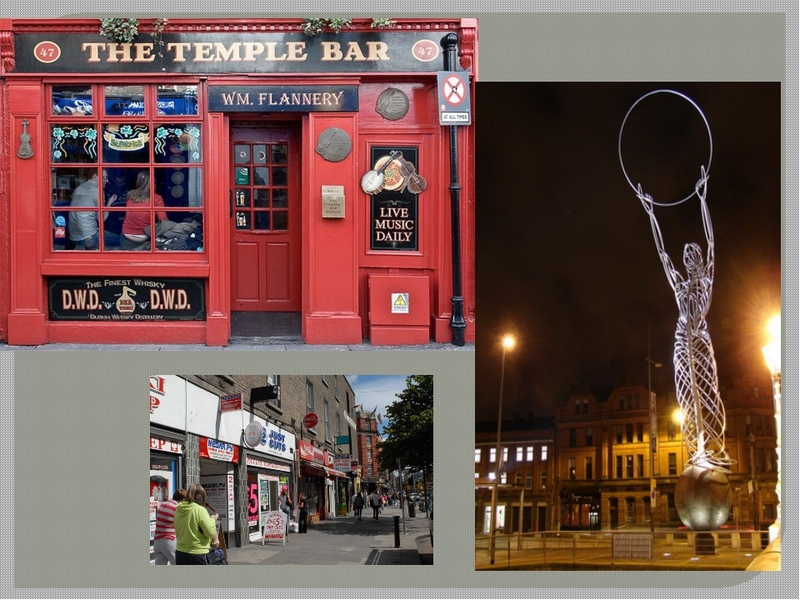 Gaelic football, rugby, hockey, basketball, cricket and hurling. The main exception is association football (soccer), which has separate governing bodies for each jurisdiction. Scotland, administrative division of the kingdom of Great Britain, occupying the northern third of the island of Great Britain. 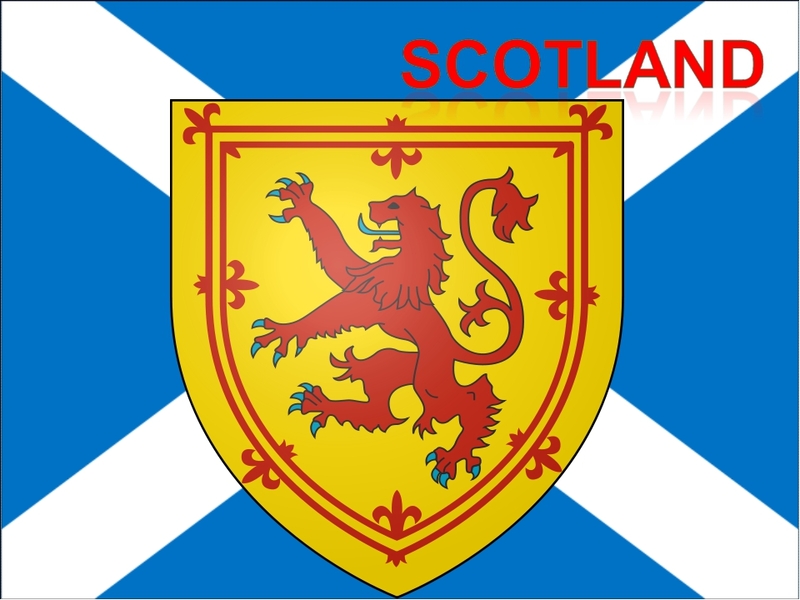 Scotland is bounded on the north by the Atlantic Ocean; on the east by the North Sea; on the southeast by England; on the south by Solway Firth, which partly separates it from England, and by the Irish Sea; and on the west by North Channel, which separates it from Ireland, and by the Atlantic Ocean. As a geopolitical entity Scotland includes 186 nearby islands. The largest of the islands is the Island of Arran. 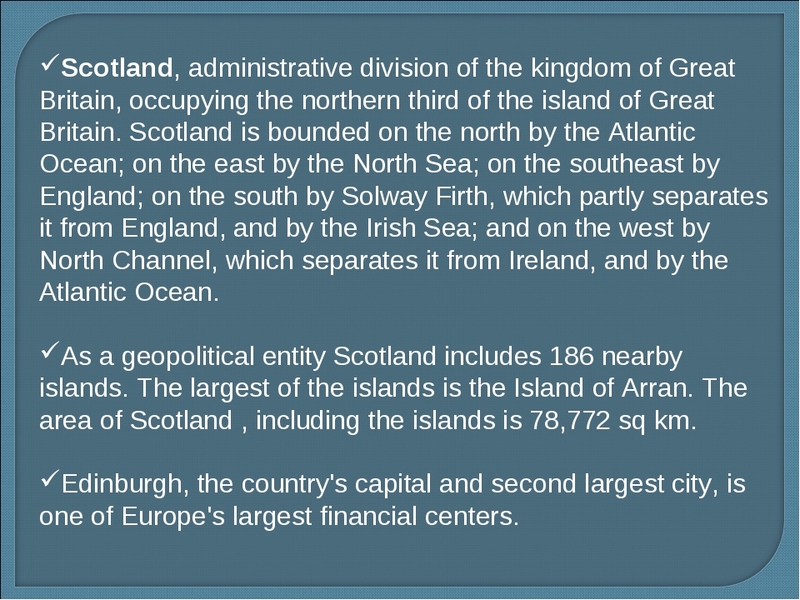 The area of Scotland , including the islands is 78,772 sq km. 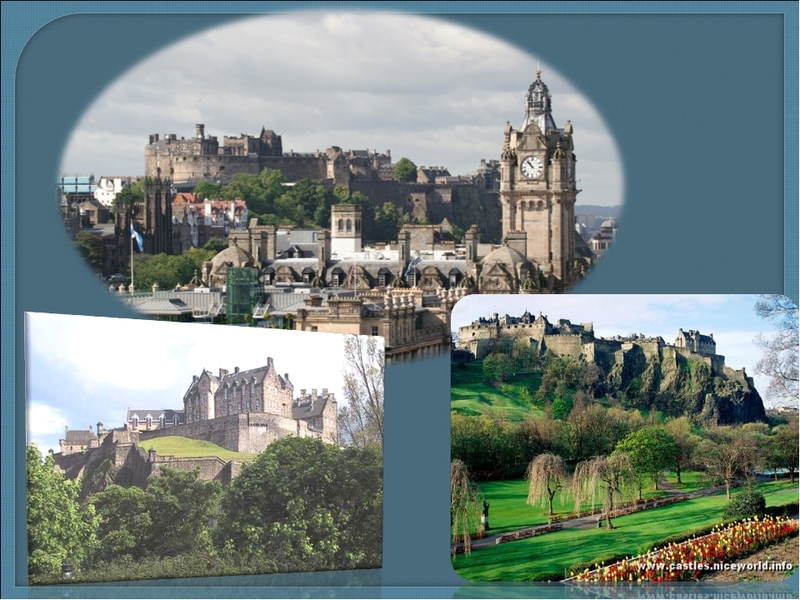 Edinburgh, the country's capital and second largest city, is one of Europe's largest financial centers. The thistle has nothing pleasant in it, especially if you carelessly touch its thorns. But it has an important meaning for the people of Scotland. 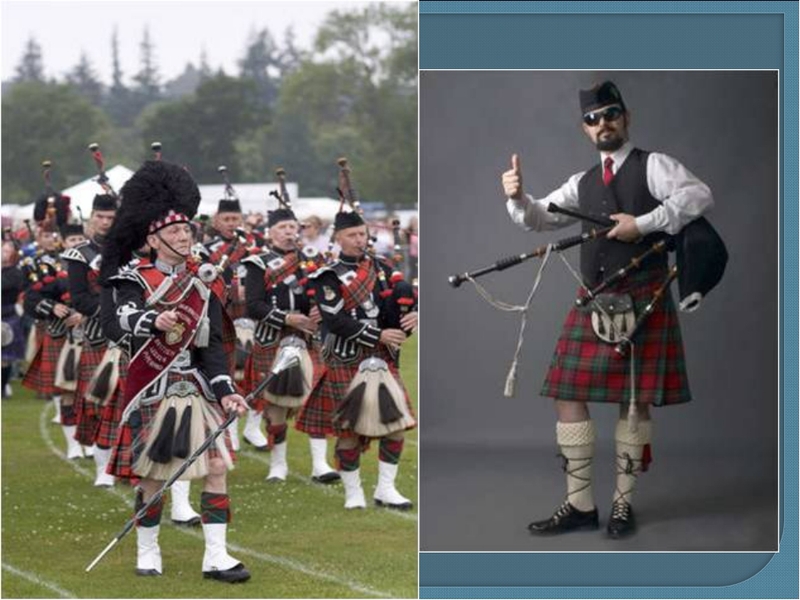 It is the Scottish national emblem. 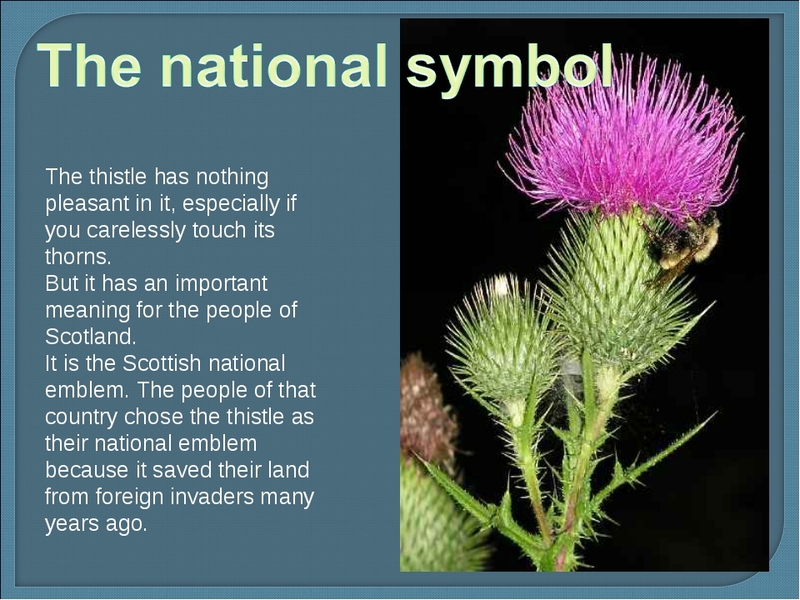 The people of that country chose the thistle as their national emblem because it saved their land from foreign invaders many years ago. Scotland is characterized by an abundance of streams and lakes (lochs). Notable among the lakes, which are especially numerous in the central and northern regions, are Loch Lomond (the largest), Loch Ness, Loch Tay, and Loch Katrine. The longest river of Scotland is the Tay; the Clyde, however, is the principal navigational stream, site of the port of Glasgow. 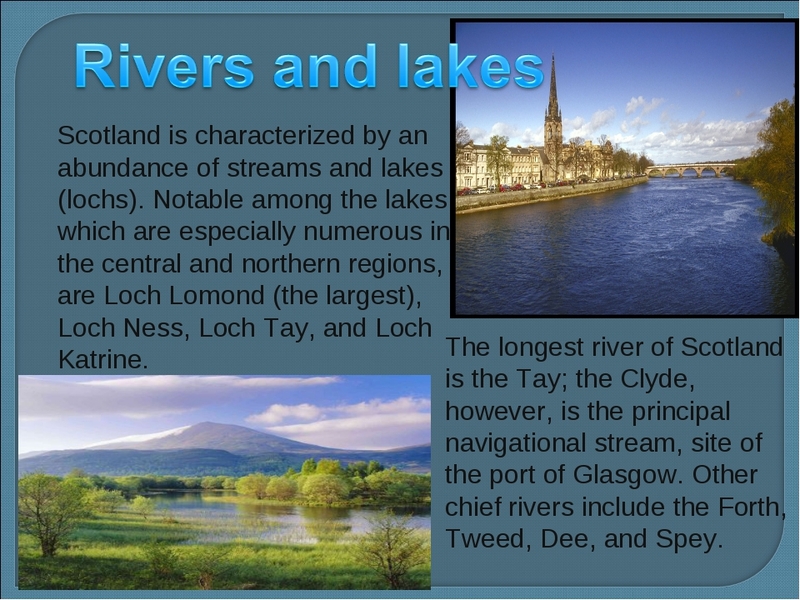 Other chief rivers include the Forth, Tweed, Dee, and Spey. 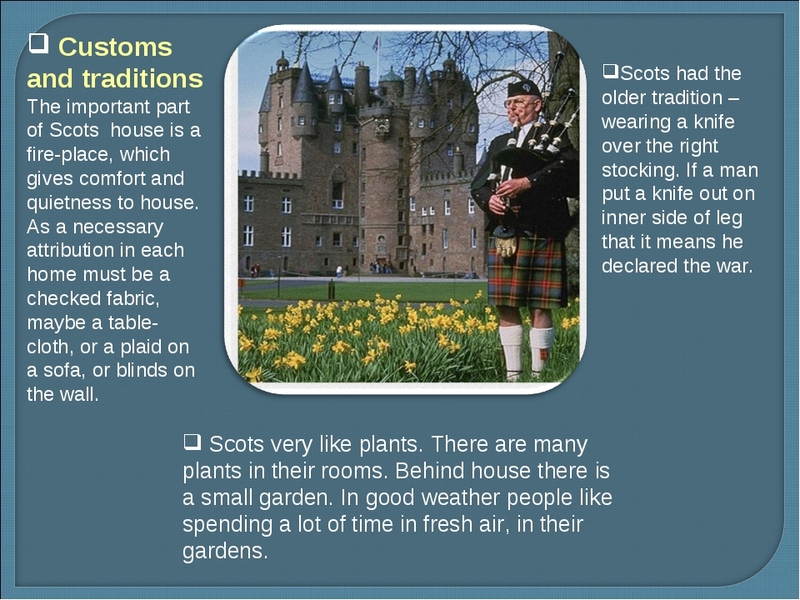 Scots very like plants. There are many plants in their rooms. Behind house there is a small garden. 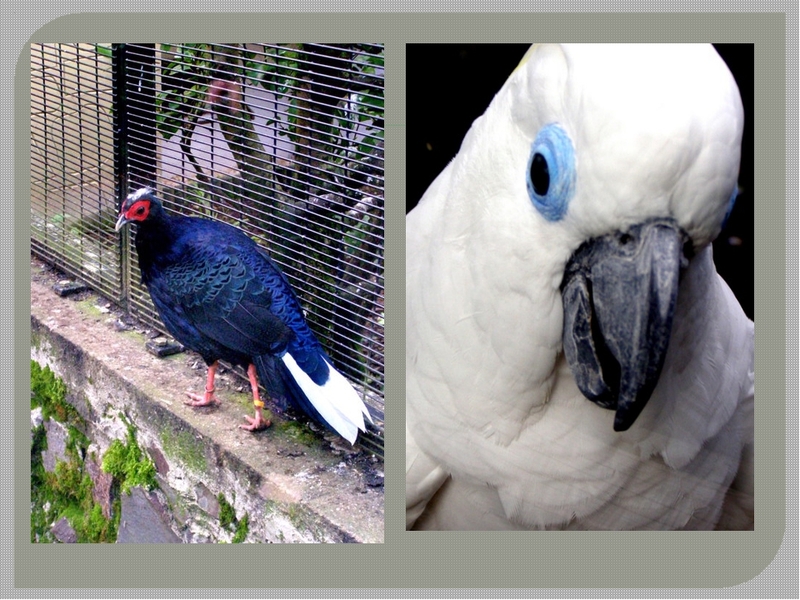 In good weather people like spending a lot of time in fresh air, in their gardens. Customs and traditions The important part of Scots house is a fire-place, which gives comfort and quietness to house. As a necessary attribution in each home must be a checked fabric, maybe a table-cloth, or a plaid on a sofa, or blinds on the wall. Scots had the older tradition – wearing a knife over the right stocking. If a man put a knife out on inner side of leg that it means he declared the war. Government Scotland is governed as an integral part of Great Britain. It is represented by 72 members in the House of Commons and by 16 Scottish peers in the House of Lords. Scottish affairs are administered by a British cabinet ministry, headed by the secretary of state for Scotland. The statutory functions of the secretary of state are discharged by five main departments of equal status: the Department of Agriculture and Fisheries for Scotland, the Scottish Development Department, the Scottish Education Department, the Scottish Home and Health Department, and the Industry Department for Scotland. Each is administered by a secretary who is responsible to the secretary of state. 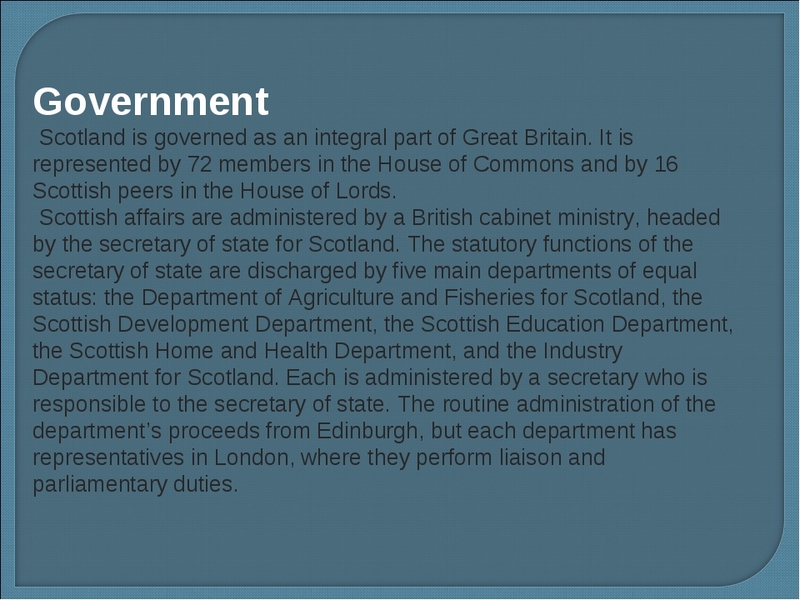 The routine administration of the department’s proceeds from Edinburgh, but each department has representatives in London, where they perform liaison and parliamentary duties. 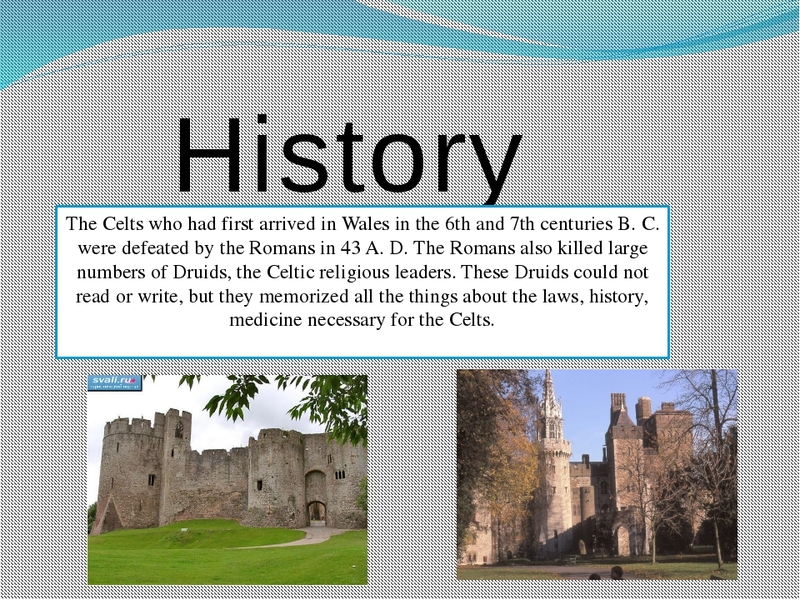 History The Celts who had first arrived in Wales in the 6th and 7th centuries B. C. were defeated by the Romans in 43 A. D. The Romans also killed large numbers of Druids, the Celtic religious leaders. These Druids could not read or write, but they memorized all the things about the laws, history, medicine necessary for the Celts. 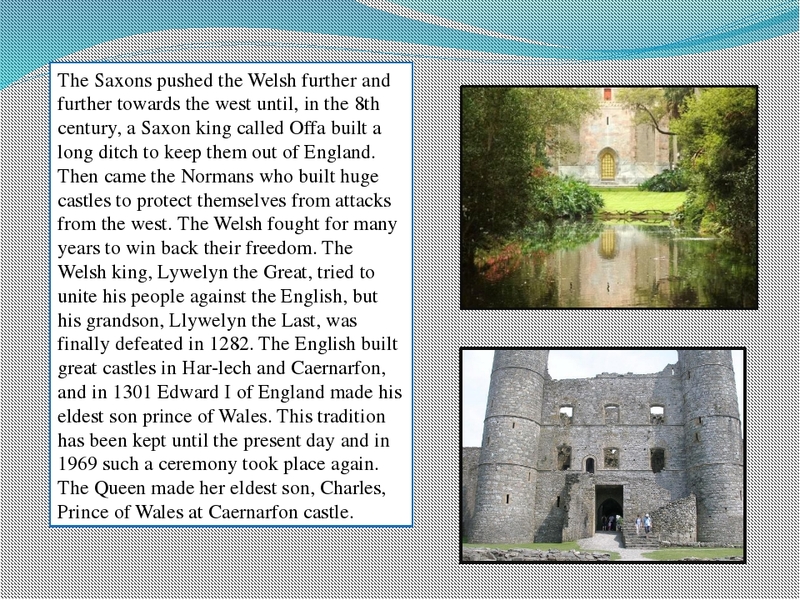 The Saxons pushed the Welsh further and further towards the west until, in the 8th century, a Saxon king called Offa built a long ditch to keep them out of England. Then came the Normans who built huge castles to protect themselves from attacks from the west. The Welsh fought for many years to win back their freedom. The Welsh king, Lywelyn the Great, tried to unite his people against the English, but his grandson, Llywelyn the Last, was finally defeated in 1282. The English built great castles in Har-lech and Caernarfon, and in 1301 Edward I of England made his eldest son prince of Wales. This tradition has been kept until the present day and in 1969 such a ceremony took place again. The Queen made her eldest son, Charles, Prince of Wales at Caernarfon castle. Geography Where is Wales? 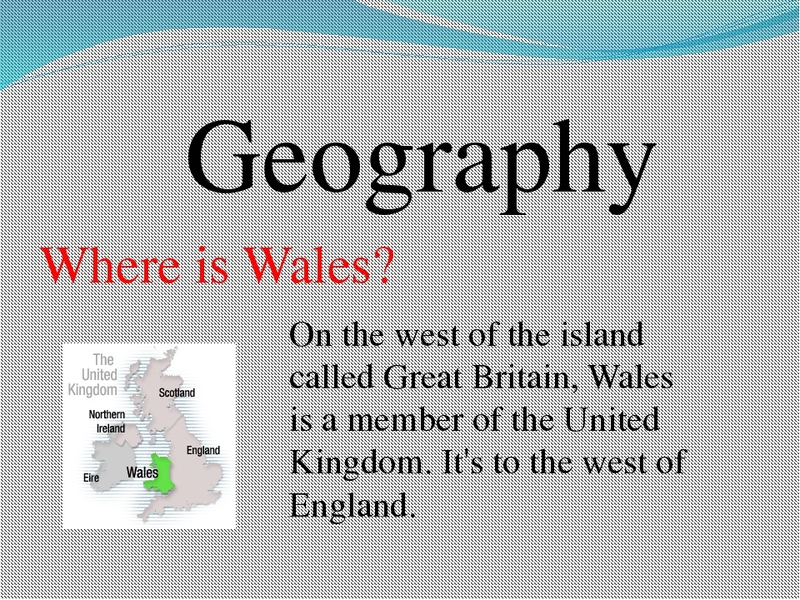 On the west of the island called Great Britain, Wales is a member of the United Kingdom. It's to the west of England. 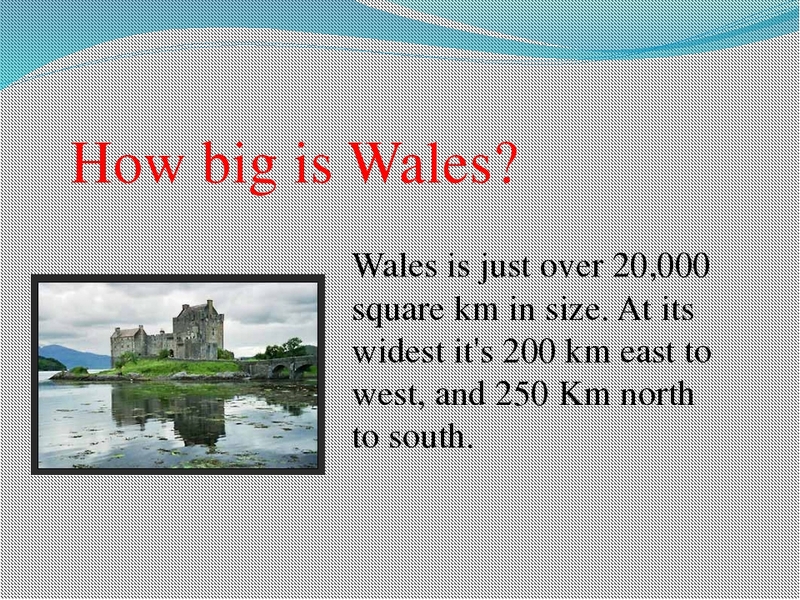 How big is Wales? Wales is just over 20,000 square km in size. At its widest it's 200 km east to west, and 250 Km north to south. 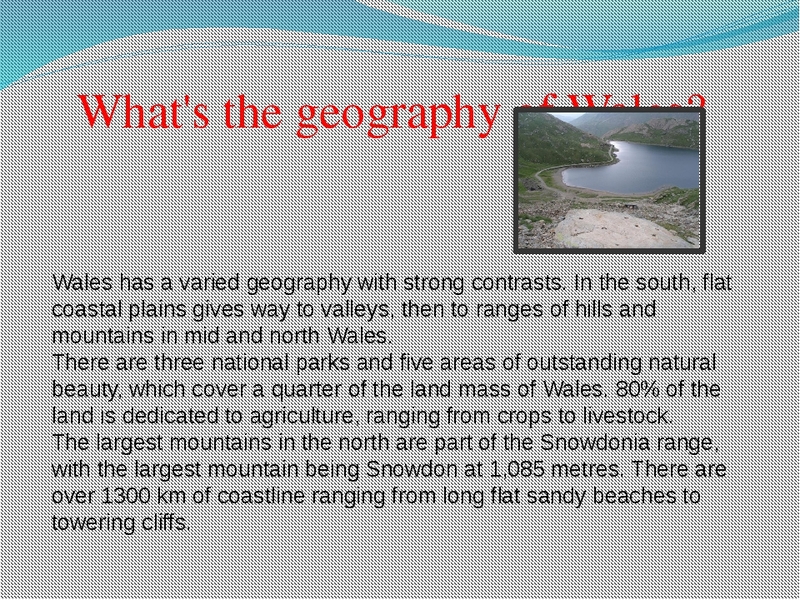 What's the geography of Wales? 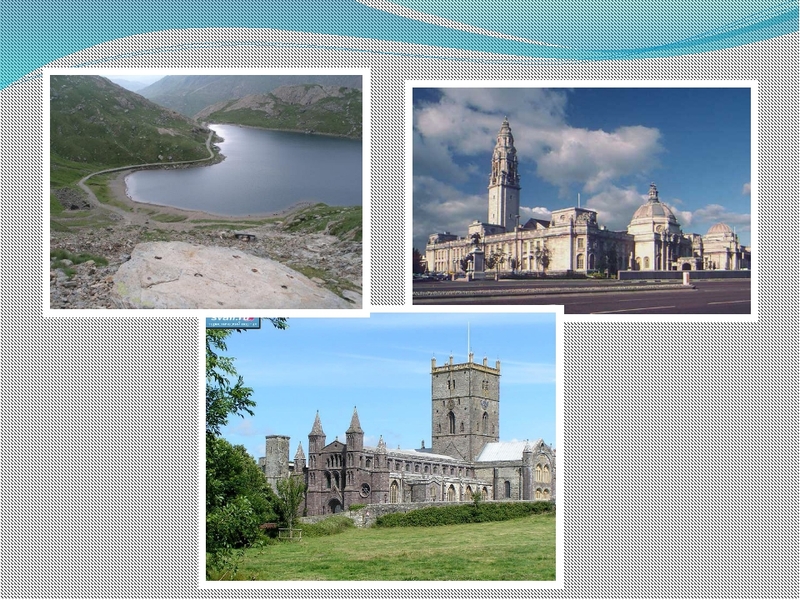 Wales has a varied geography with strong contrasts. In the south, flat coastal plains gives way to valleys, then to ranges of hills and mountains in mid and north Wales. There are three national parks and five areas of outstanding natural beauty, which cover a quarter of the land mass of Wales. 80% of the land is dedicated to agriculture, ranging from crops to livestock. The largest mountains in the north are part of the Snowdonia range, with the largest mountain being Snowdon at 1,085 metres. There are over 1300 km of coastline ranging from long flat sandy beaches to towering cliffs. 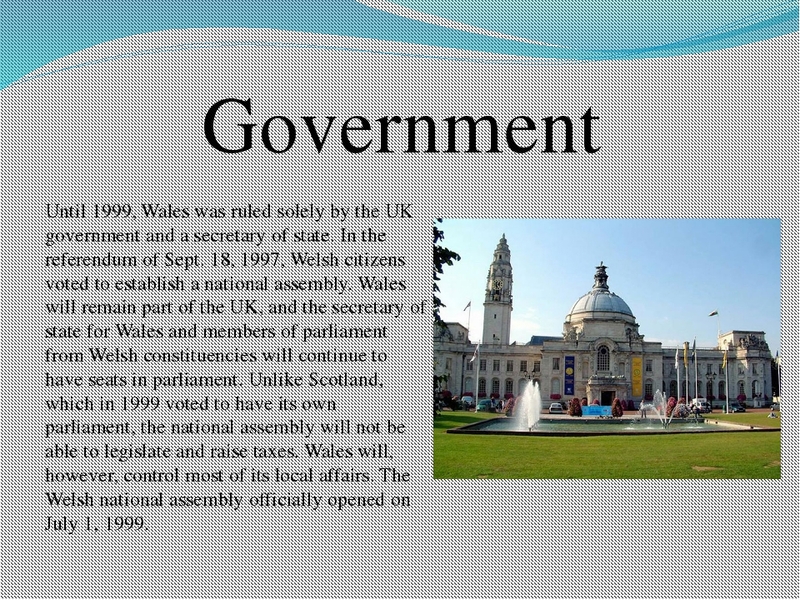 Government Until 1999, Wales was ruled solely by the UK government and a secretary of state. 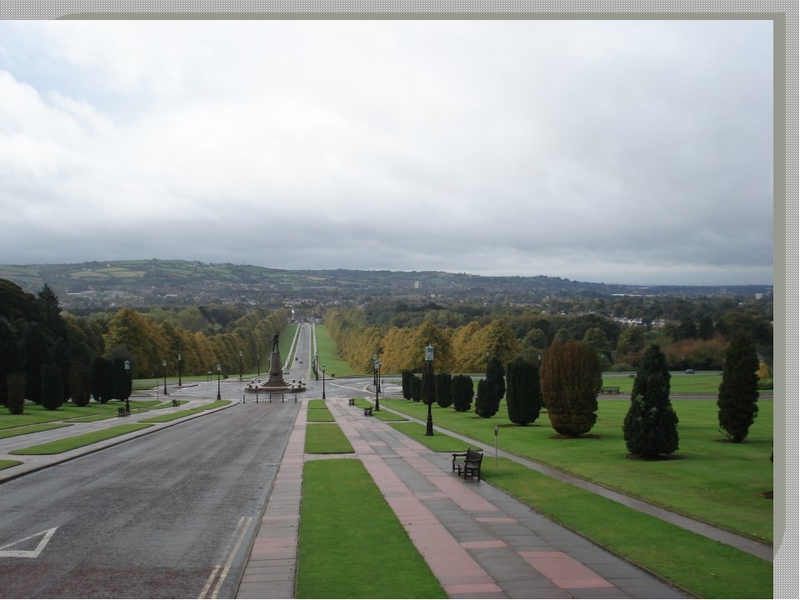 In the referendum of Sept. 18, 1997, Welsh citizens voted to establish a national assembly. Wales will remain part of the UK, and the secretary of state for Wales and members of parliament from Welsh constituencies will continue to have seats in parliament. Unlike Scotland, which in 1999 voted to have its own parliament, the national assembly will not be able to legislate and raise taxes. Wales will, however, control most of its local affairs. 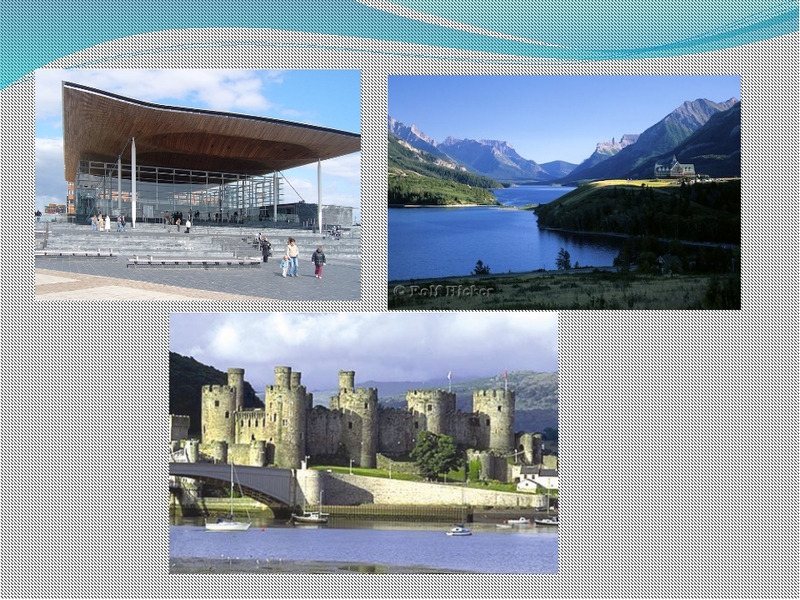 The Welsh national assembly officially opened on July 1, 1999. What's the population of Wales? The people of Wales are descended from many ethnic groups, including the original Britons and other population groups including the Celts, Romans and Scandinavians. Around three quarters of the 2.94 million population are concentrated around the large cities and mining valleys of the south east of the country. In the last 100 years, Wales has welcomed many diverse new groups to settle and be part of its population. 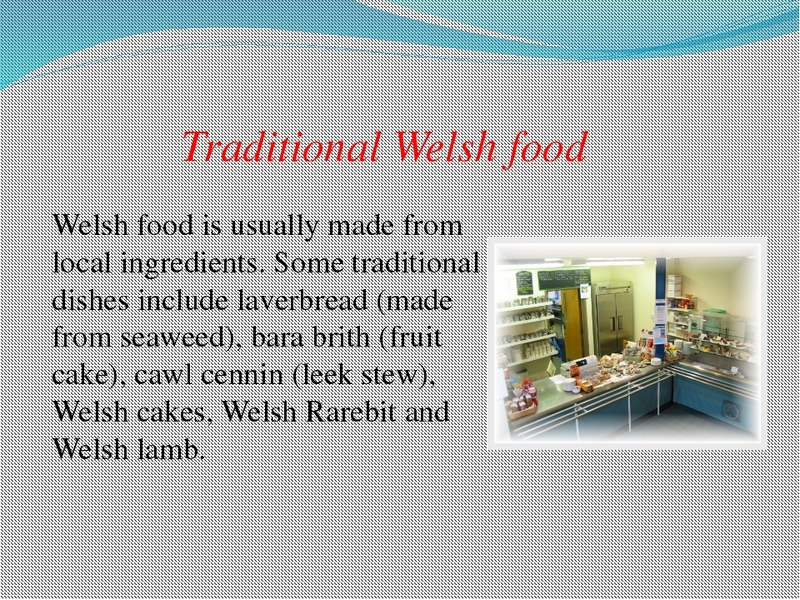 Traditional Welsh food Welsh food is usually made from local ingredients. 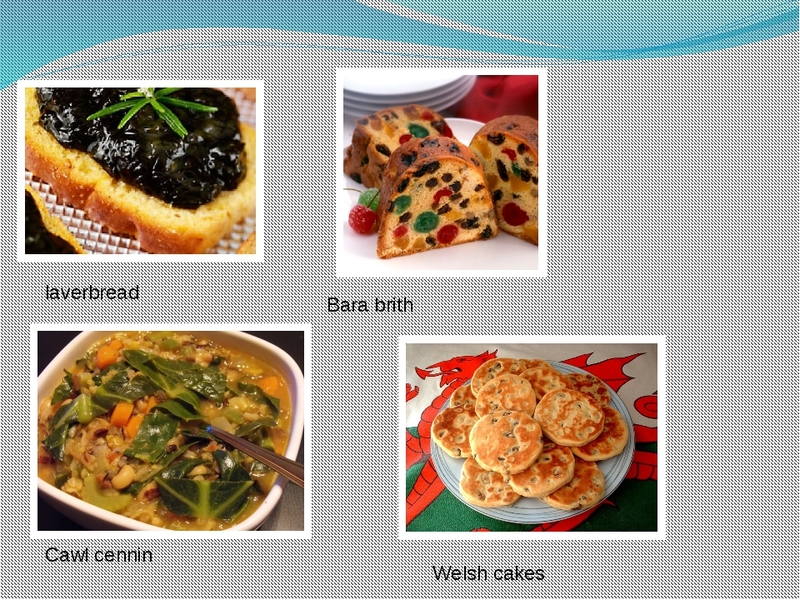 Some traditional dishes include laverbread (made from seaweed), bara brith (fruit cake), cawl cennin (leek stew), Welsh cakes, Welsh Rarebit and Welsh lamb. The plan of the lesson on country studying. 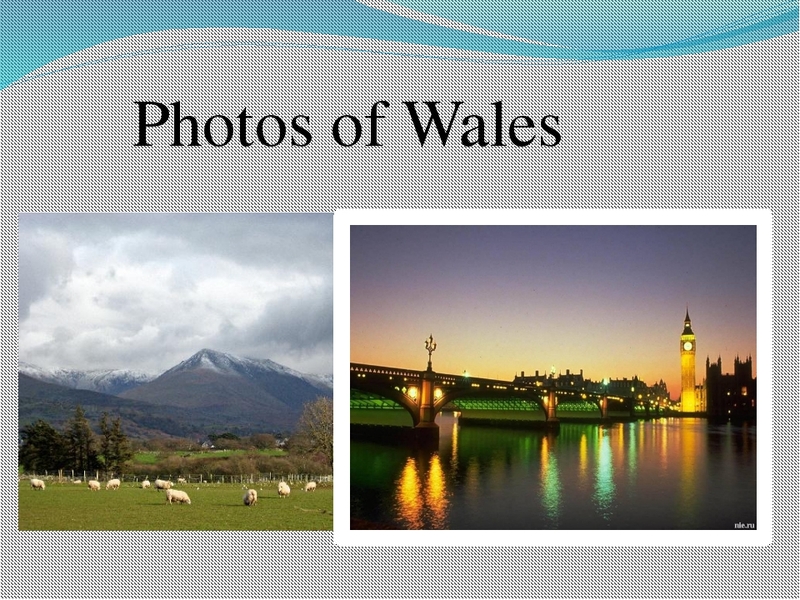 The theme of the lesson: Wales. Scotland. Northern Ireland. 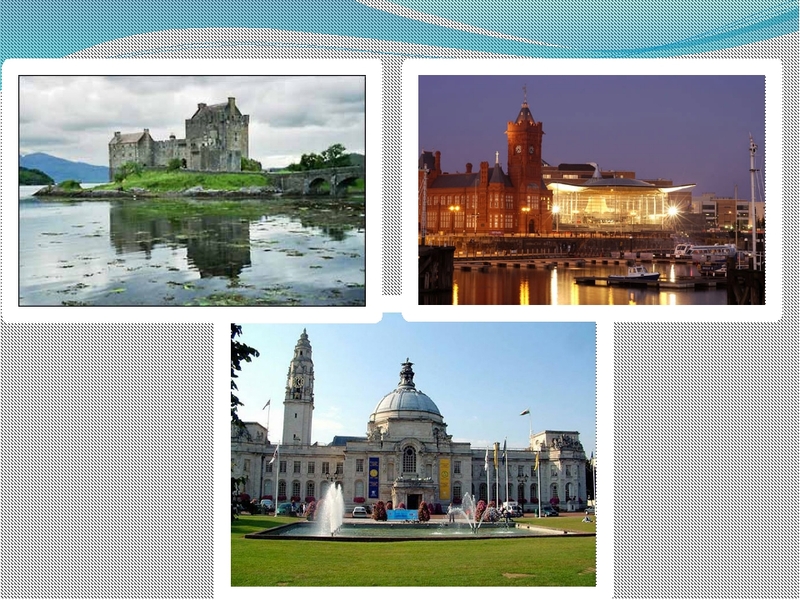 The aim: To form students` ideas of Wales, Scotland, Northern Ireland. The tasks: Enlargement of lexicon upon the theme. Systematization and summing up of knowledge. Using the knowledge in practice. 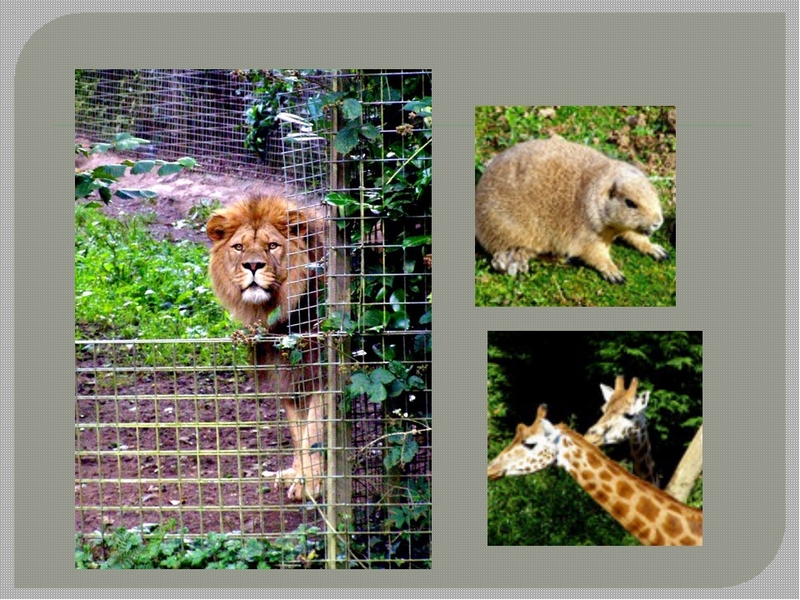 Development of students` speech, skills to analyse and to sum up. Education of positive motives of studying, professional skills. Supplementary material: cards with proper names and numbers; a map; questions; “Window on Britain” 1; presentations upon the theme. The course of the lesson. –Good morning everybody. How are you today? Have you prepared everything for our lesson? Are you ready to begin it? So sit down and let’s begin to work. 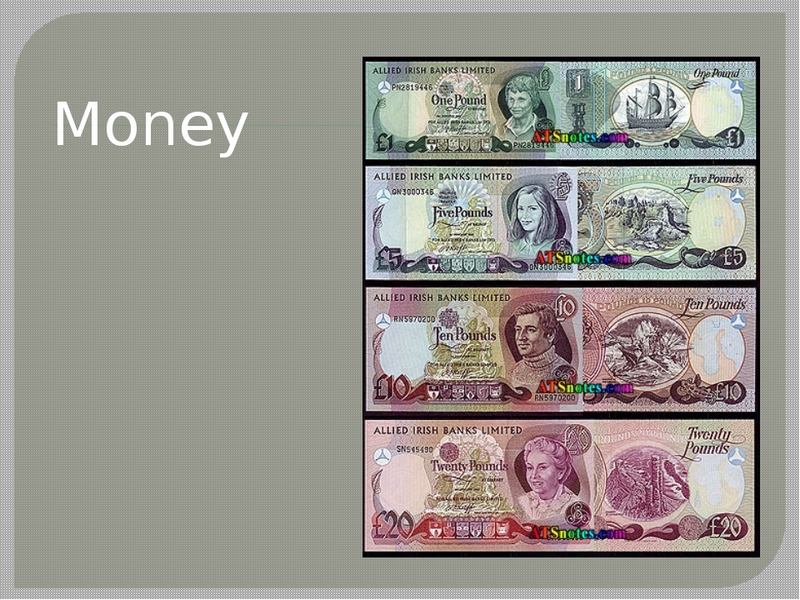 Information about the theme and the aim of the lesson. –Today we’ll continue to speak about Great Britain. 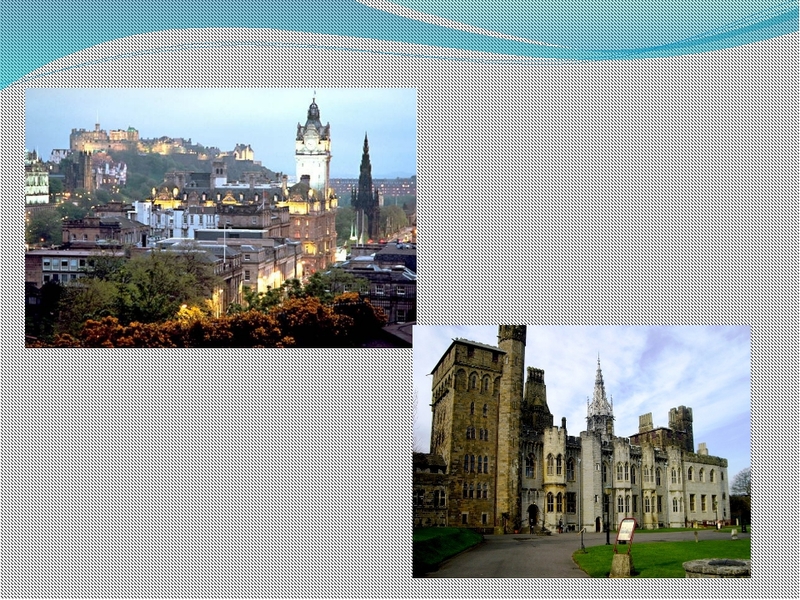 And during the lesson you’ll learn new material about Scotland, Wales and Northern Ireland. I want you to be attentive, active, work very well and try to do your best to show your knowledge. –You’ve coped with this task very well. –Can you show all these items on the map? IV. Checking up of the home task. Learning the new material. –Now tell me please, what is your home task for today? 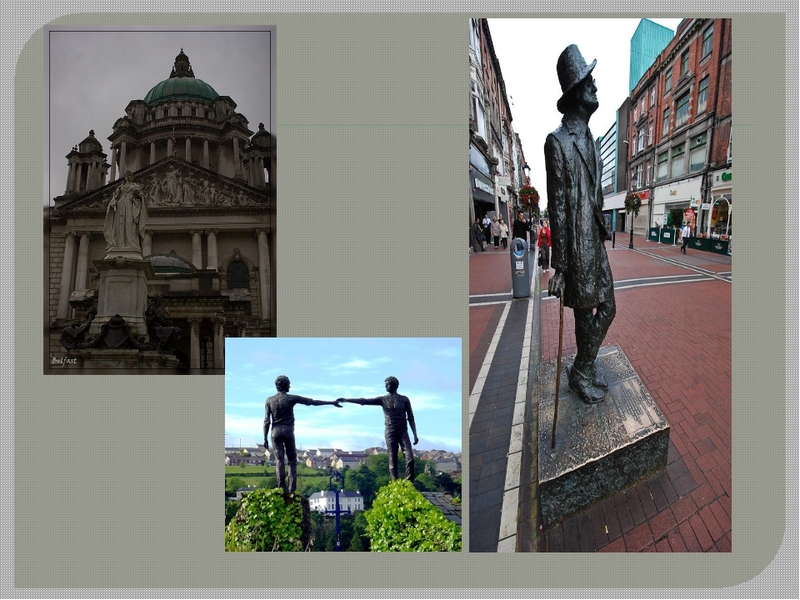 (working in three groups to find material upon the theme and to prepare its presentation (slide-show), three countries: Wales, Scotland, Northern Ireland). –So let’s see how you`ve worked at home. Every group will present its country, the rest two groups should listen very attentively. Before every presentation I`ll give you a list of questions you should answer, make necessary notes and try to understand and remember as much as possible. Every group will have 13 minutes. 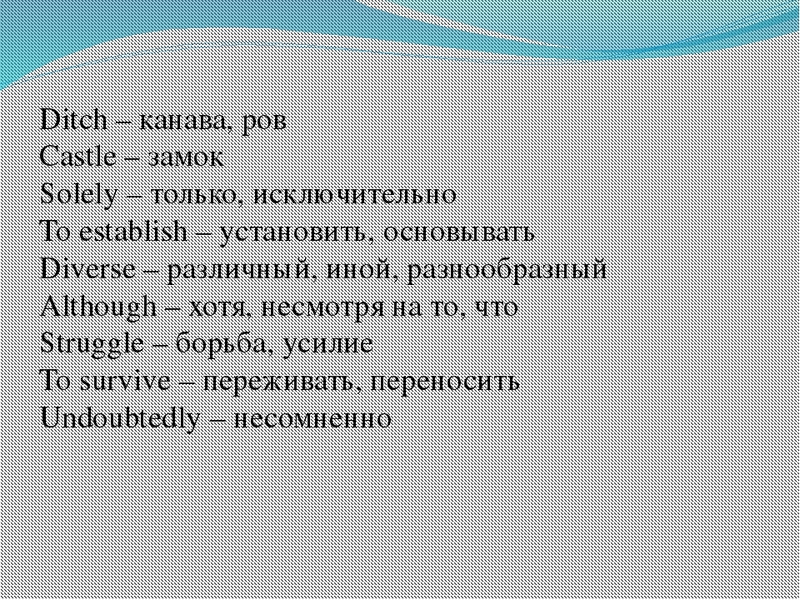 And do not forget to introduce new words other students need to understand the material you`ll present. Summing up of the new material. (Countries, population, London, big cities, country-side, agriculture, parks, islands, trains). –Now let`s watch it the second time. – So now let`s form the sun, and I`d like you to tell us what you`ve known and remembered at our lesson best of all. (I knew that …, and what about you, …? As for my part I`d like to thank you for your good work during the lesson. You were very good team-players, go on in this way! 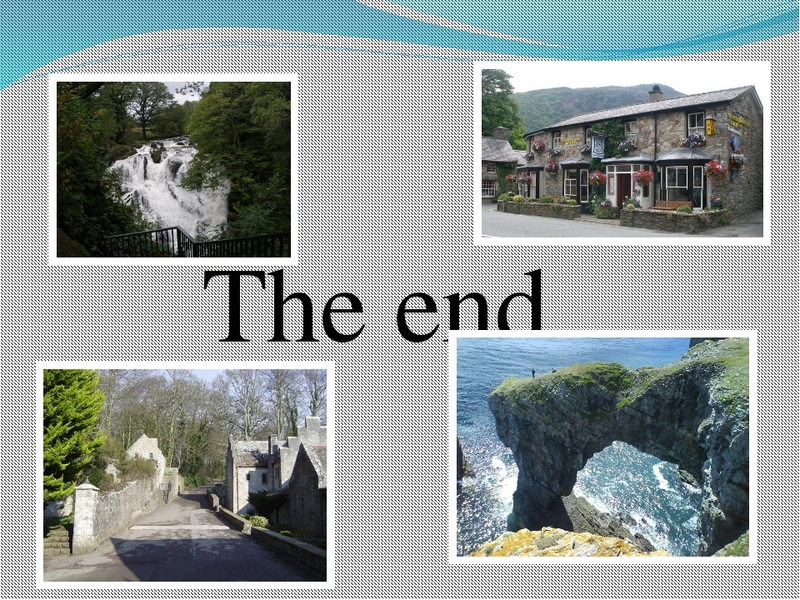 Home task: reading lecture № 5, retelling the material about Wales, Scotland, Northern Ireland. 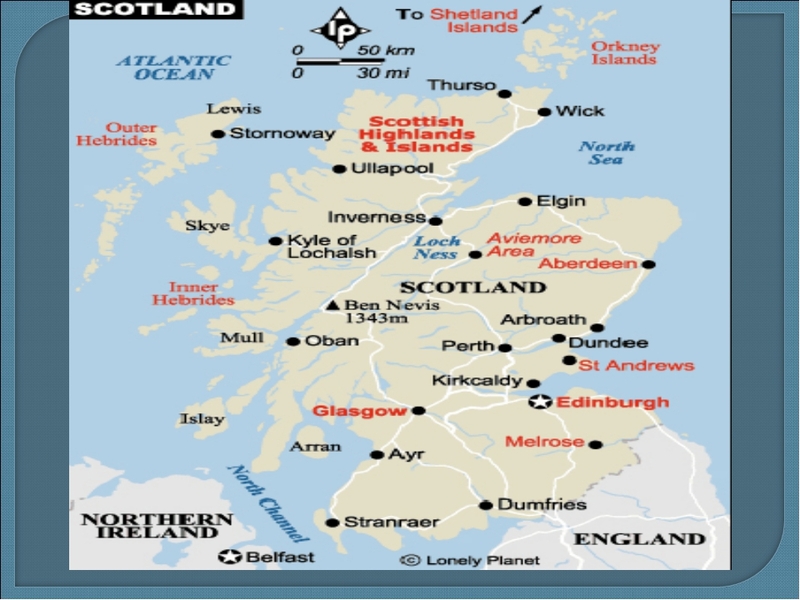 Scotland is the most northern part of the island of Great Britain. Its population is over 5 million people. Scotland was inhabited mainly by the Picts. In the 6th century, the Scots from Ireland (or Scotia) settled in what is now Argyll, giving their name to the present-day Scotland. During the 9th century, the various parts of Scotland united in defence against the Vikings. The powerful monarchy which existed in England threatened Scottish independence throughout the Middle Ages. In 1603 James VI of Scotland became also James I of England when Queen Elizabeth I of England died without children. In 1651 Scotland was united with England, although Scotland kept its own parliament. In 1707, both countries, realizing the benefits of closer political and economic union, agreed on a single parliament for Great Britain. The Cheviot Hills mark the boundary between England and Scotland. The greater part of Scotland is surrounded by sea. 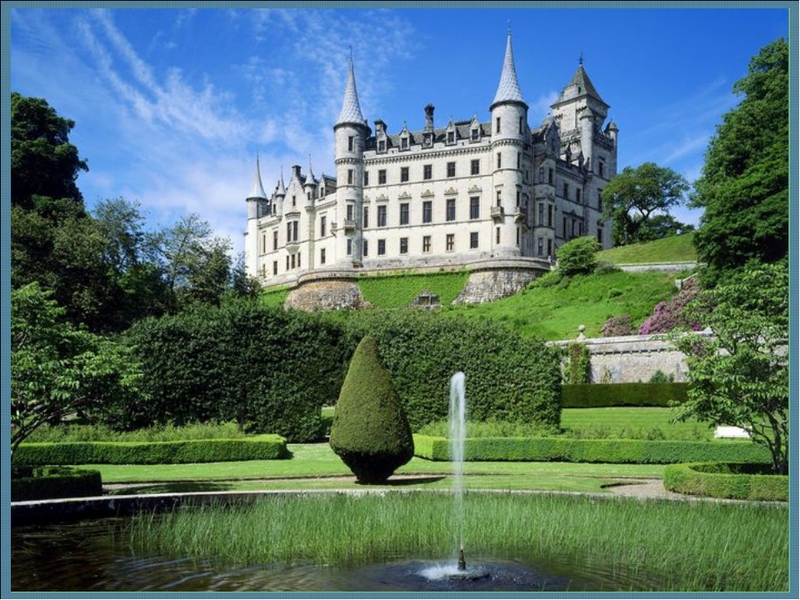 Scotland includes the Hebrides off the west coast and the Orkney and Shetland Is­lands off the north coast. It is bounded by the North Sea on the east. Scotland is divided into three parts: the Highlands, the Lowlands and the Southern Uplands. The Highlands are among the oldest mountains in the world. There are a lot of valleys and lakes in this region, the best known lake is Loch Ness. Most of the population of Scotland is concentrated in the Lowlands. The biggest city is Glasgow. 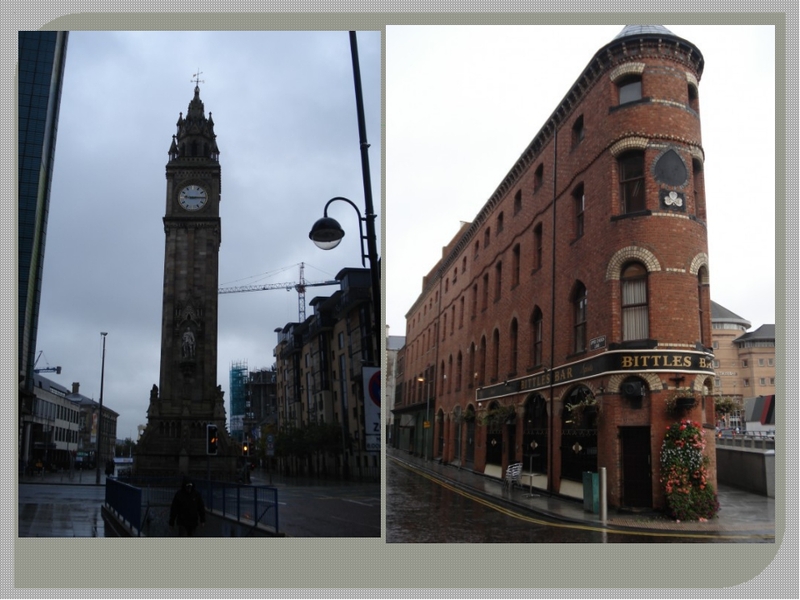 It is an industrial city and an important port in the United Kingdom. Shipbuilding is the leading industry. But other industries such as iron and steel, engineering and coal-mining are highly developed too. The capital of Scotland is Edinburgh. 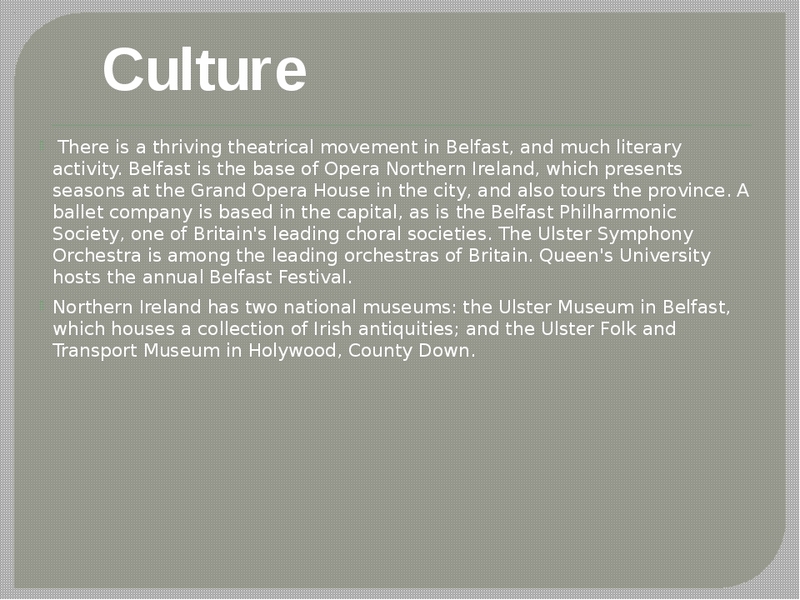 It is the cultural centre of Scotland. In 1301 after defeating the native princes of Wales, King Edward I of England named his son Prince of Wales. Since then the eldest son of the King or Queen of England has traditionally been given this title. 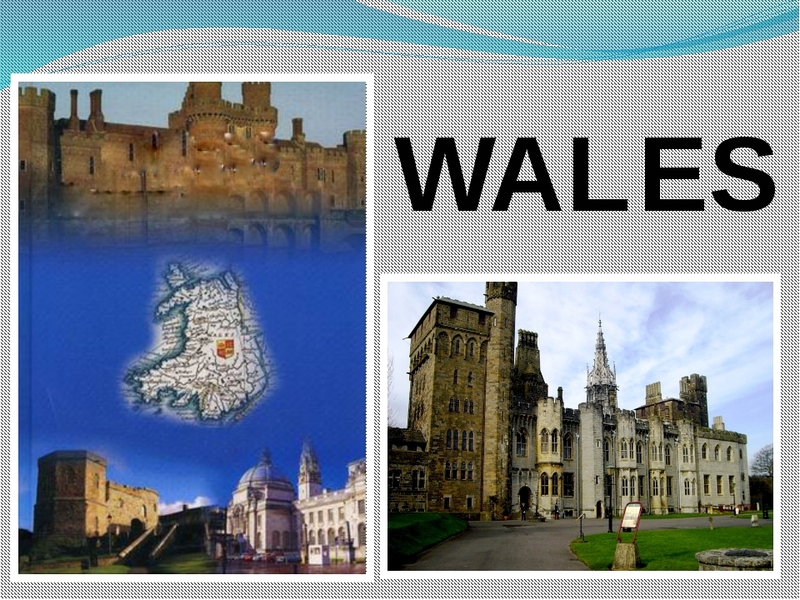 In 1536 Wales was brought into the English system of national and local government by Act of Union. Most of Britain was inhabited by Celts until the 4th century. 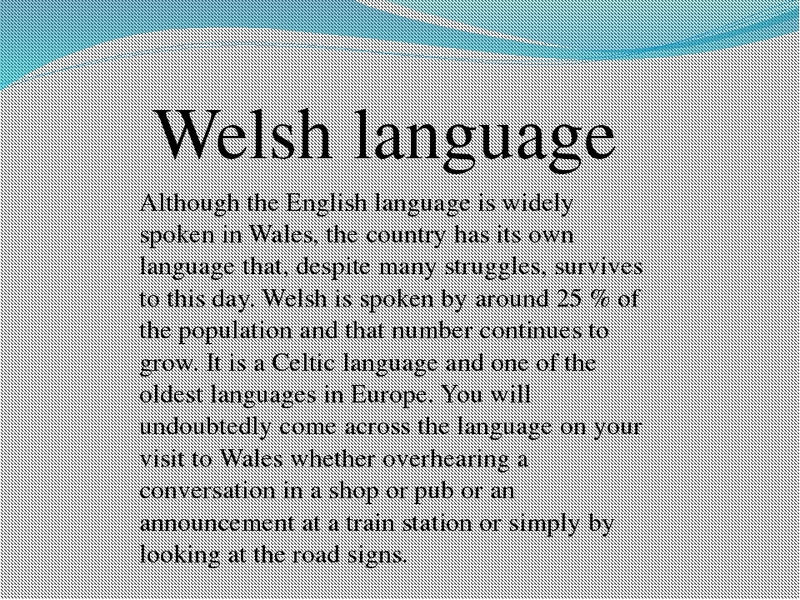 Welsh and English are both official languages in Wales now. The population of Wales is over 3 million people. 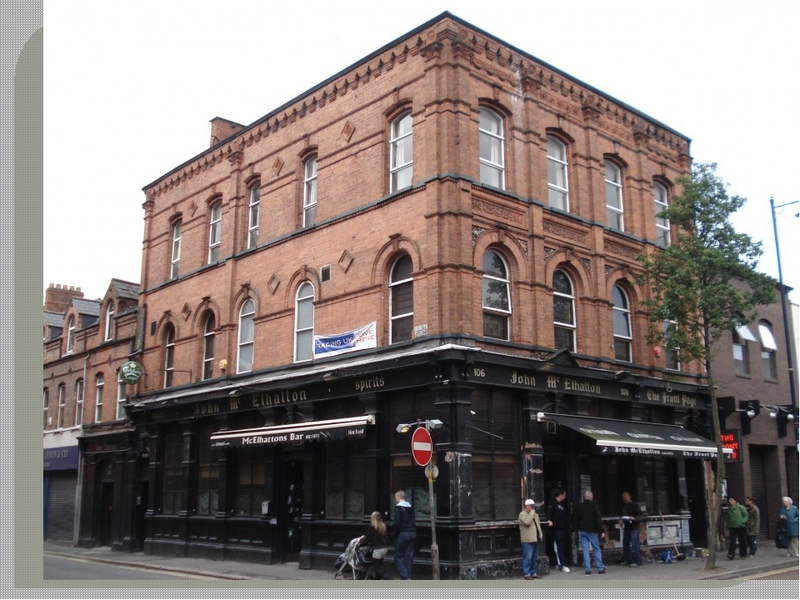 About 75% of the people of Wales live in urban districts. Wales is a highland country of old, hard rocks. North Wales is a country of mountains and deep valleys. South Wales is a land of high hills. The capital of Wales is Cardiff (an industrial city and a port). 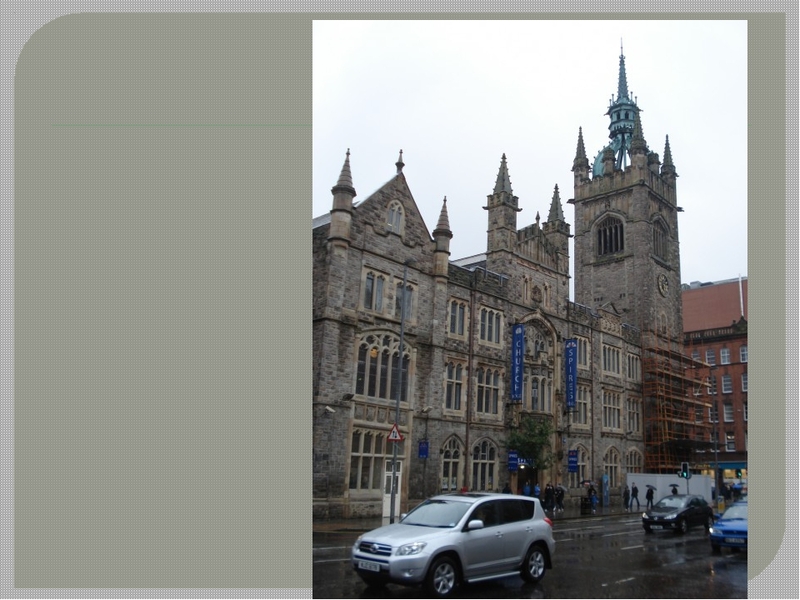 Cardiff is an administrative and educational centre. Such industries as coal-mining, steel production, electronics, electrical engineering are developed in this part of the country. The Welsh are fond of folk music, singing and poetry. Welsh literature is one of the oldest in Europe. 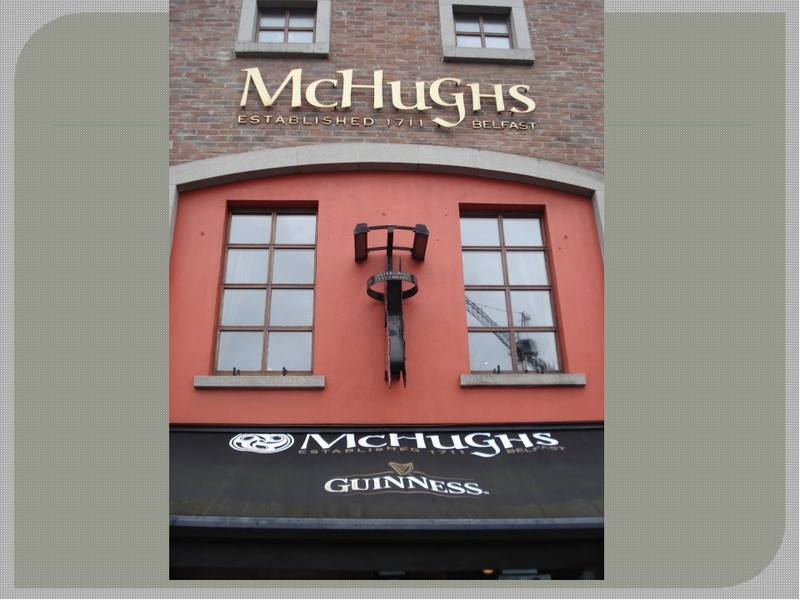 A number of kingdoms had emerged in Ireland before the Christian era. Ireland didn't escape the invasion of the Vikings, who dominated the country during the 10th century. In 1169 Henry II of England launched an invasion of Ireland. He had been granted its overlordship by the En­glish Pope Adrian IV who wanted to bring the Irish church into full obedience to Rome. The English Civil Wars (1642—1651) led to uprisings in Ireland which were crushed by Cromwell. 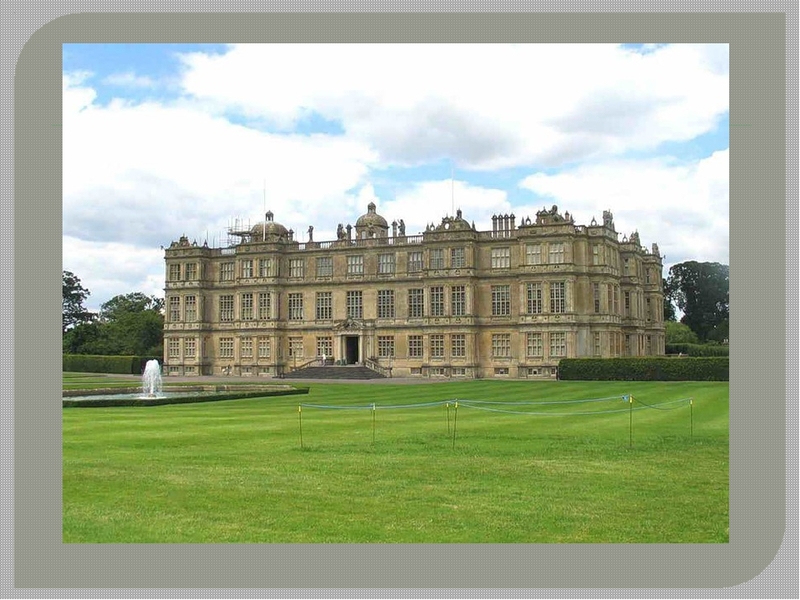 During the 18th century various efforts were made by British Government to achieve stability. 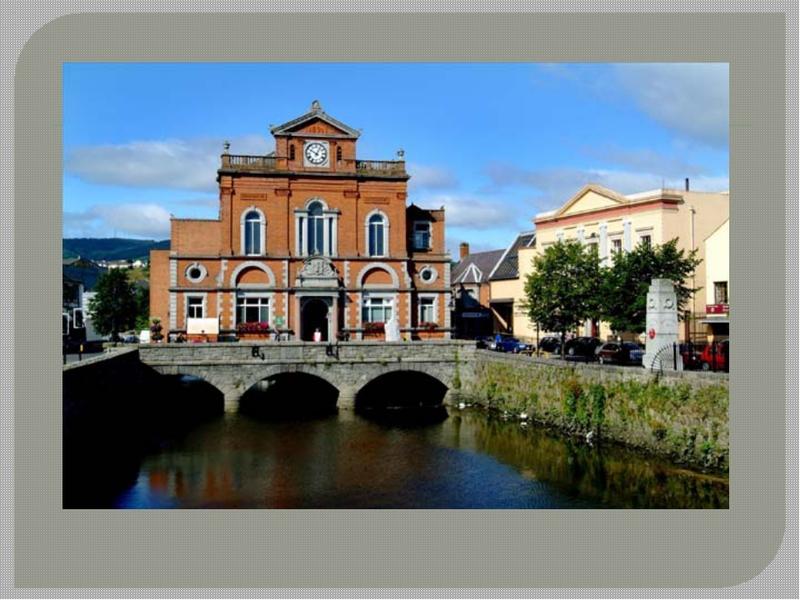 In 1800 an Act of Union between Great Britain and Ireland was signed. The "Irish question" continued as one of the major problems of British politics during the 19th century. 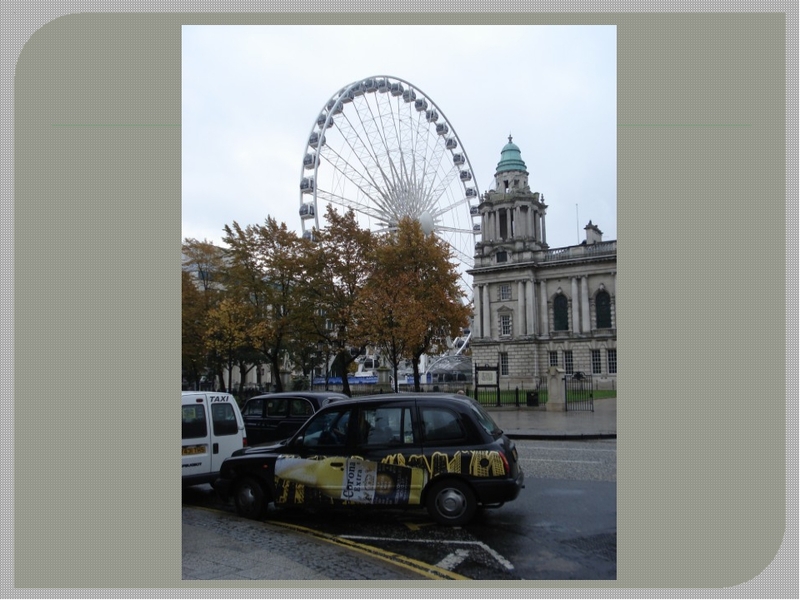 In 1985 the Angle-Irish Agreement was signed in Belfast, the capital of Northern Ireland. 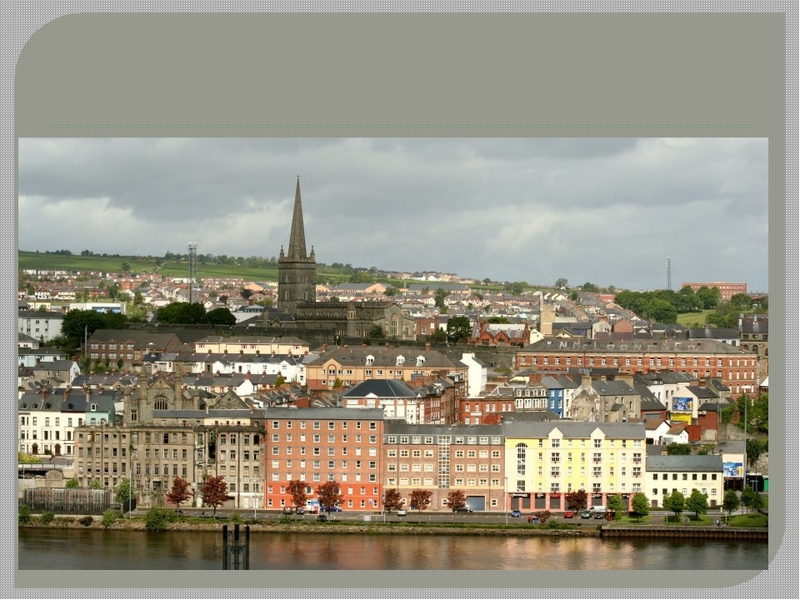 The population of Northern Ireland is about 1. 5 million people. It occupies one-sixth of the territory of the United Kingdom. 53% of the population live in urban areas. The largest industry is agriculture. 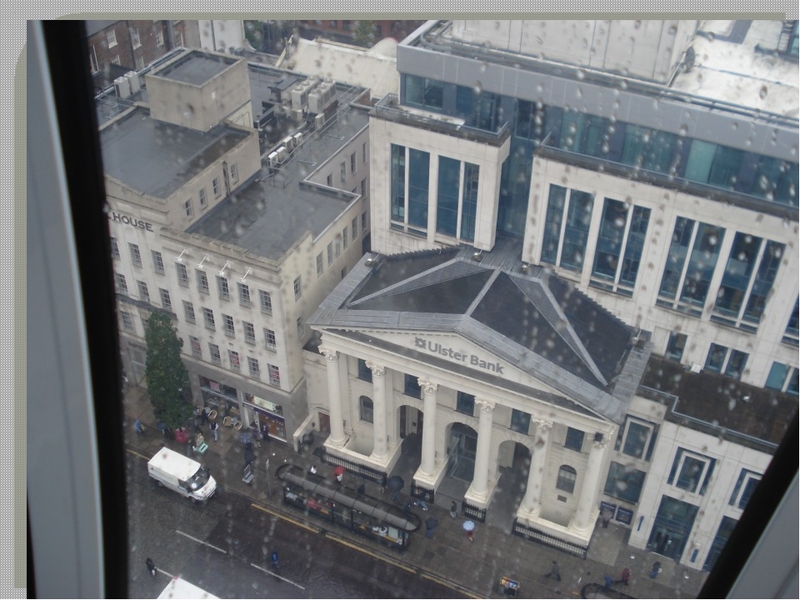 The main industrial centre and a large port is Belfast. 1. 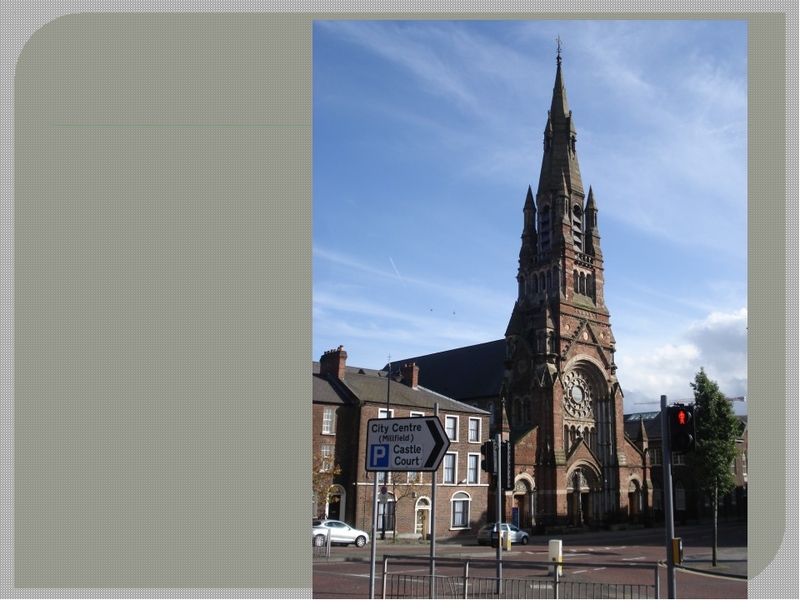 What river is the principal navigational stream in Scotland? 2. 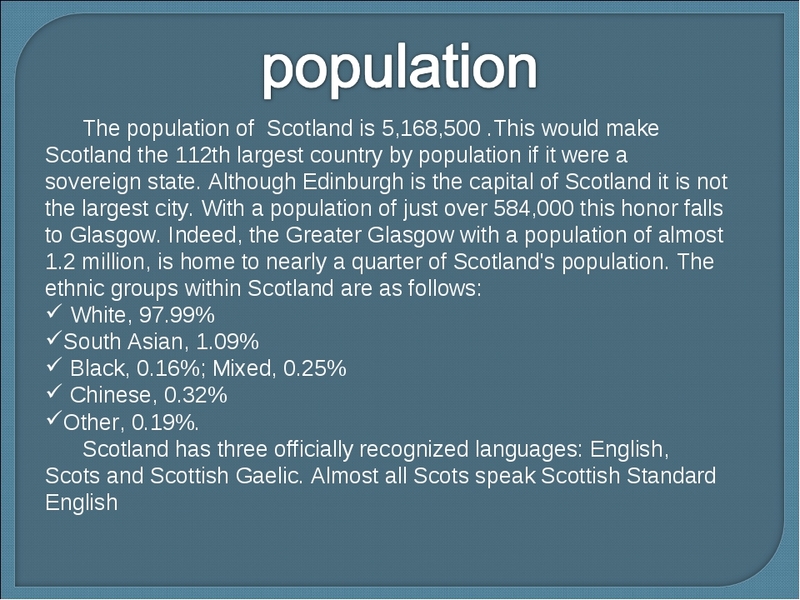 What is the population of the most populous city in Scotland? 3. What is Scotland washed by? 4. 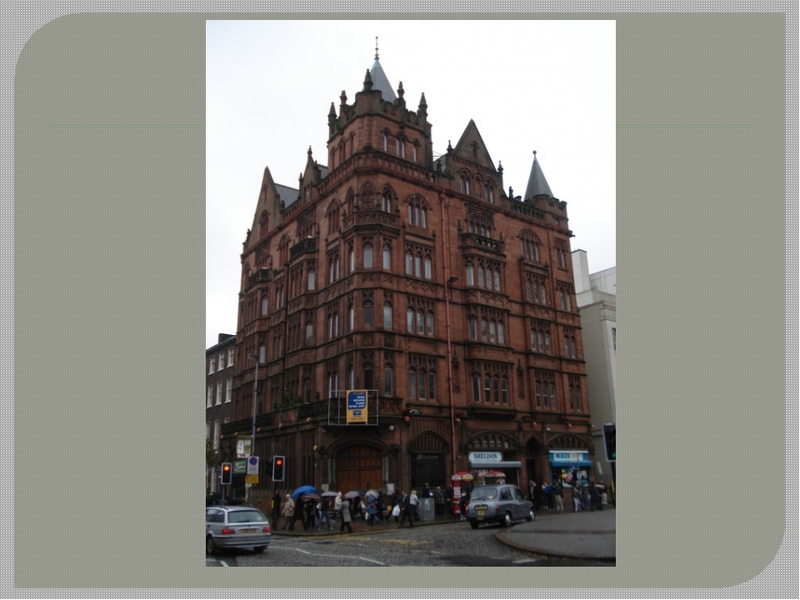 What is the capital of Scotland? 5. What is the symbol of Scotland? 6. How many members is Scotland represented by in the House of Commons and Lords? 1. What is the largest mountain in Wales? 2. Where is Wales situated? 3. How big is Wales? 4. How many national parks are there in Wales? 5. 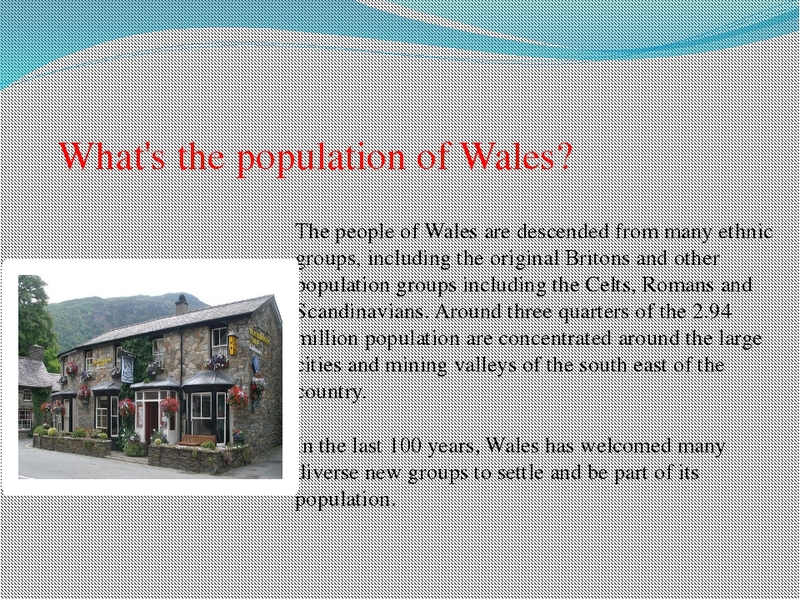 What's the population of Wales? 6. What languages do people speak in Wales? 1. 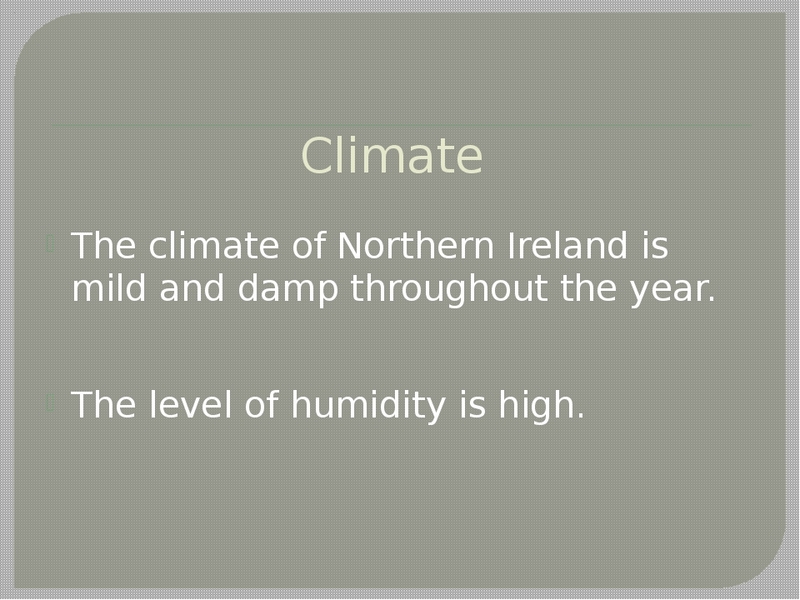 What is the climate of Northern Ireland? 2. 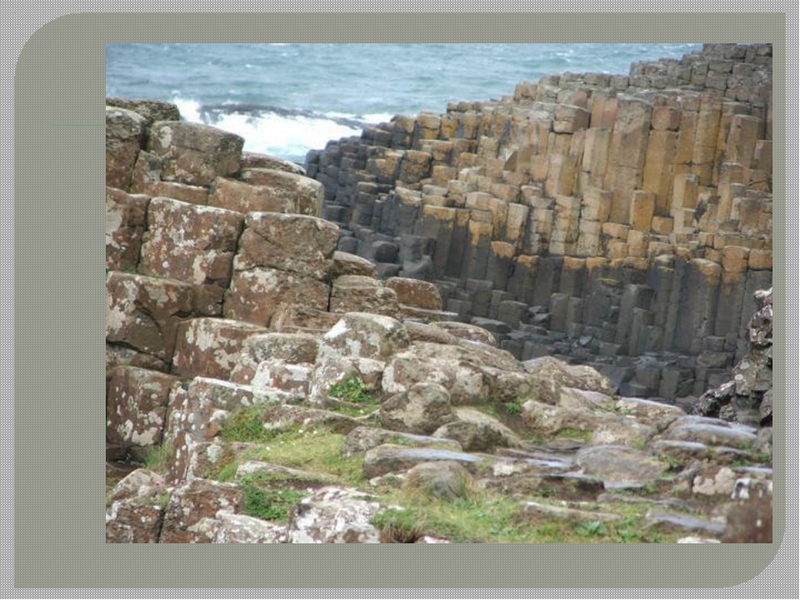 What are the most valuable natural resources in Northern Ireland? 3. 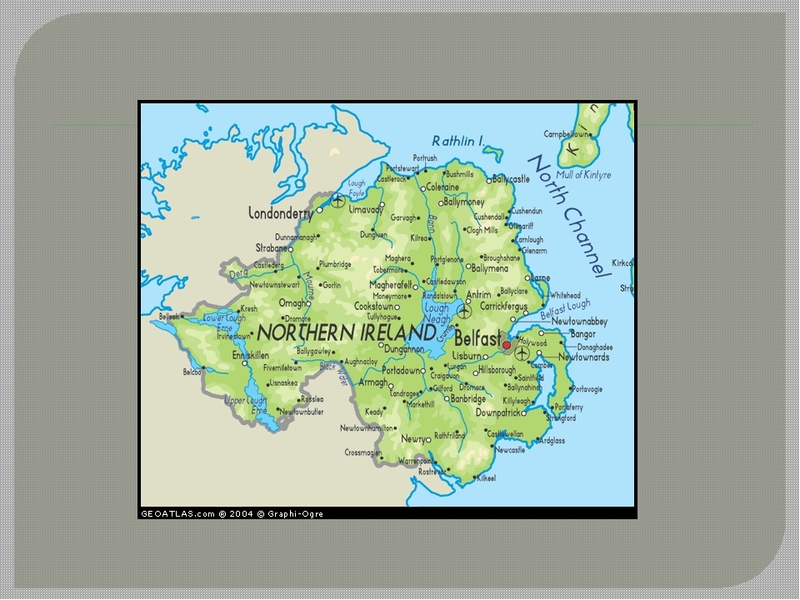 How many districts is Northern Ireland divided into? 4. What are the leading industries? 5. What national museums are there? 6. What religion is spread there? Данный урок по страноведению разработан для студентов колледжей языковых специальностей, так как предполагает хорошее владение разговорным английским языком. Является частью раздела «Великобритания». Цель урока - формирование знаний о странах входящих в состав Великобритании – Уэльсе, Шотландии и Северной Ирландии. Урок построен на активной самостоятельной деятельности учащихся с использованием метода проектов. Основная форма работы на уроке – групповая. Ожидаемые результаты обучения – способность студентов рассказать основную информацию (столица, население, географические особенности, промышленность и т.д.) о трёх странах. К конспекту урока прилагаются 3 презентации, подготовленные студентами, а также вопросы к данным презентациям.